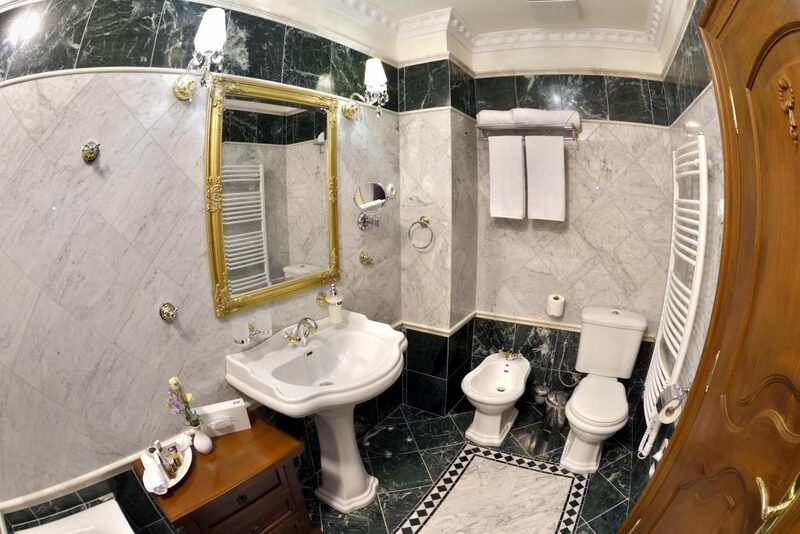 The Deluxe Double rooms are situated on the ground floor, on the 1st floor and two rooms on the 1st underground floor. The majority of them is found on the 1st floor, on the “piano nobile” representative floor in original dwelling spaces of the castle nobility. 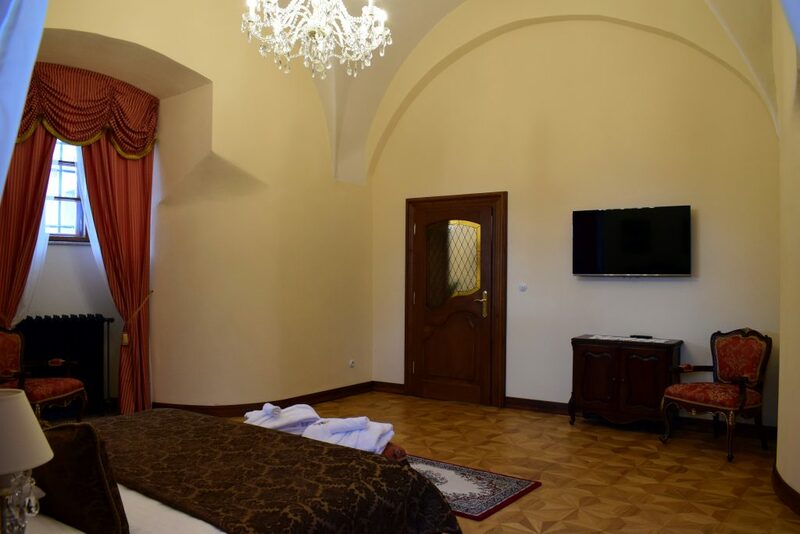 The Deluxe rooms are furnished in various historical styles through which the castle has passed during its rich building history. 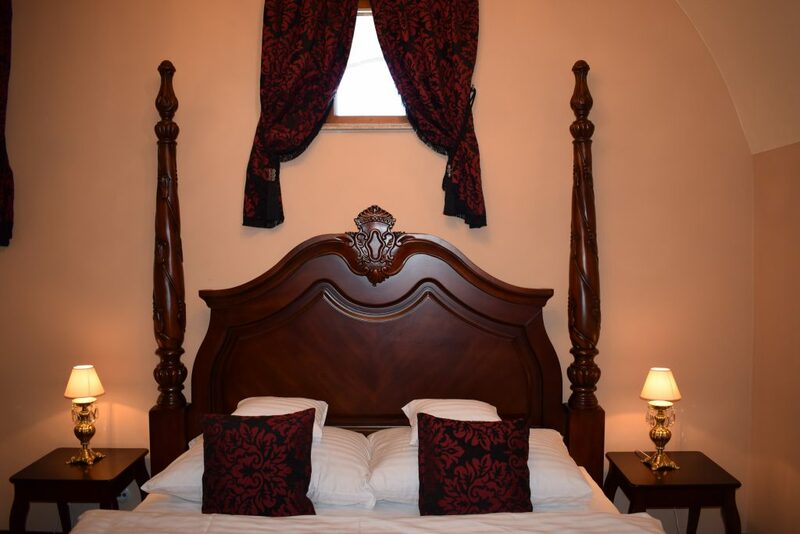 So the guests can accommodate in rooms furnished in Gothic Style, in Styles of Renaissance, Baroque or Empire. The rooms are spacious, furnished with a perfect good taste and they provide a high measure of comfort. In eight rooms are found the copies of ceramic stove ovens, there is a fireplace in one room. 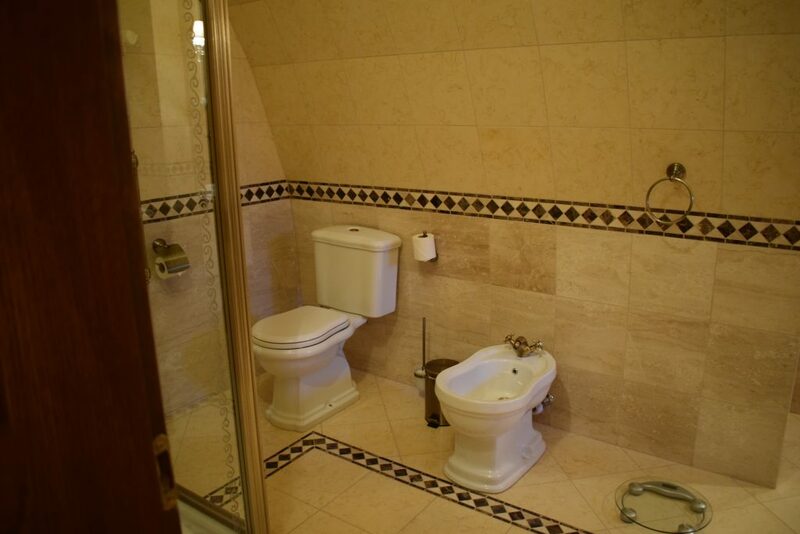 Every room is equipped by a matrimonial bed, bathroom with marble lining, shower or bathtub, toilet and bidet. 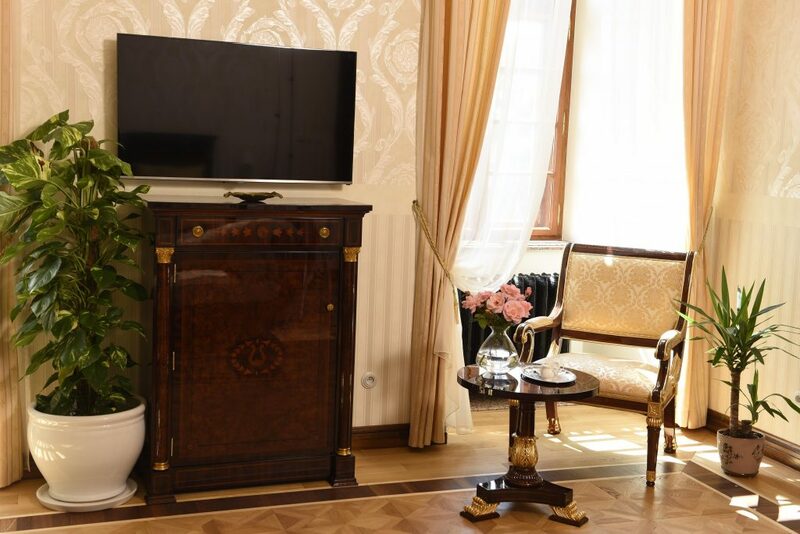 The guests have available the Internet, telephone, TV-set, mini-bar, safe and work table. There is a possibility of an extra bed and on request a child little bed in all rooms. 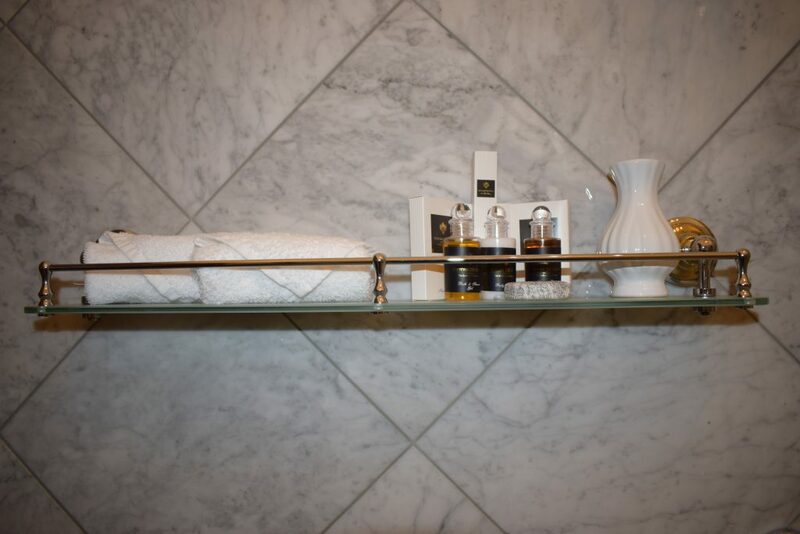 The breakfast, mineral water, welcome drink, entry to wellness (swimming pool, whirlpool tub, steam sauna, Finnish sauna, fitness) are provided free of charge to the accommodated guests. 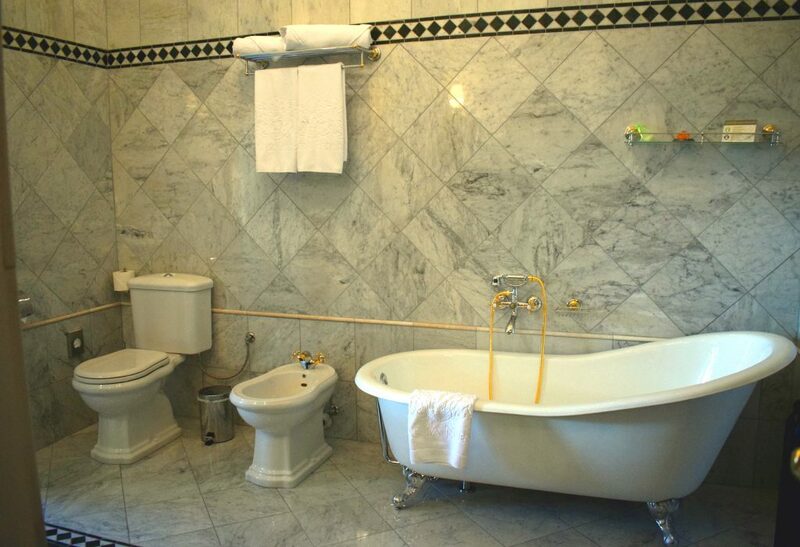 The above-mentioned is provided free of charge also to the guests accommodated on the extra bed. 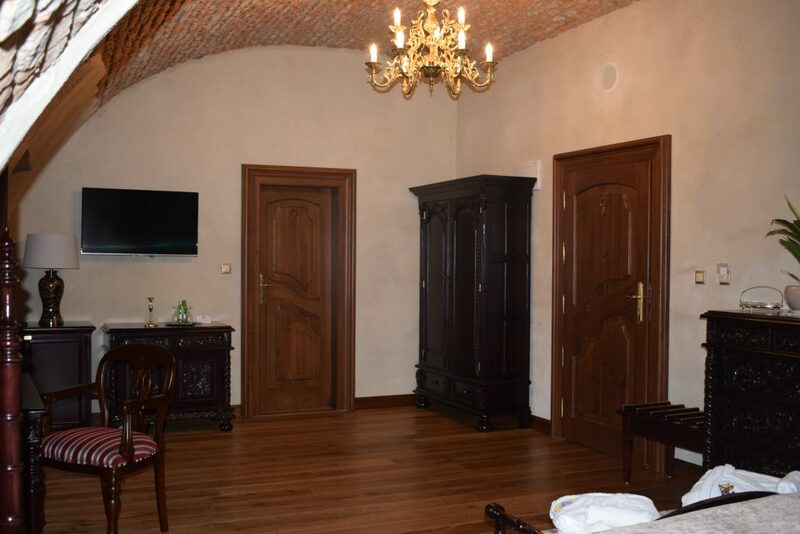 The Deluxe Double room SLAVOMIR is situated in frontal part of the north-east castle wing on the first underground floor. Thanks to its location it offers a nice outlook of South-Slovak hollow and Revúcka vrchovina highlands to the guests. It is situated the nearest to the wellness and therefore it is sufficient for the visitors to do several steps and in a few seconds they can indulge in relax in whirlpool bathtub, saunas or they can have a swim in swimming pool. 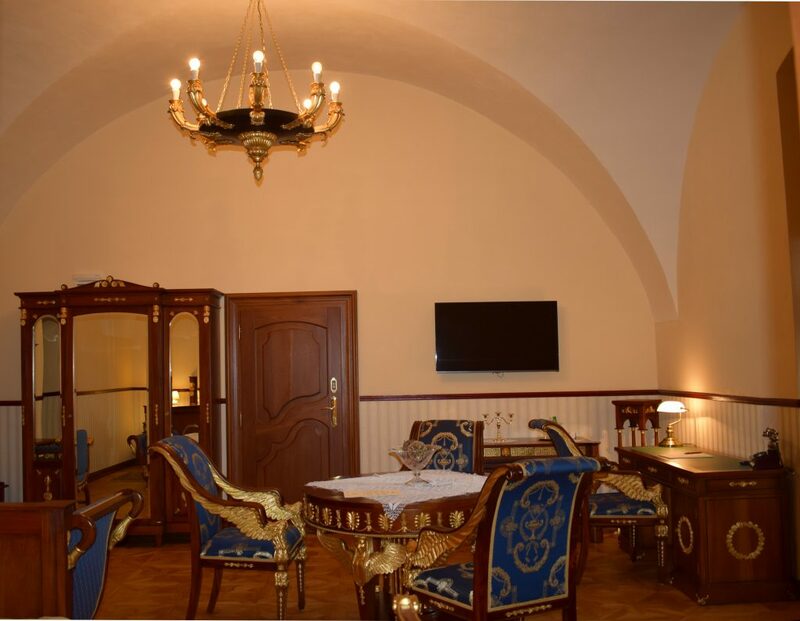 On the same floor a castle wine tavern is also found and also the restaurant, castle hall and hotel reception are speedy and easy available. 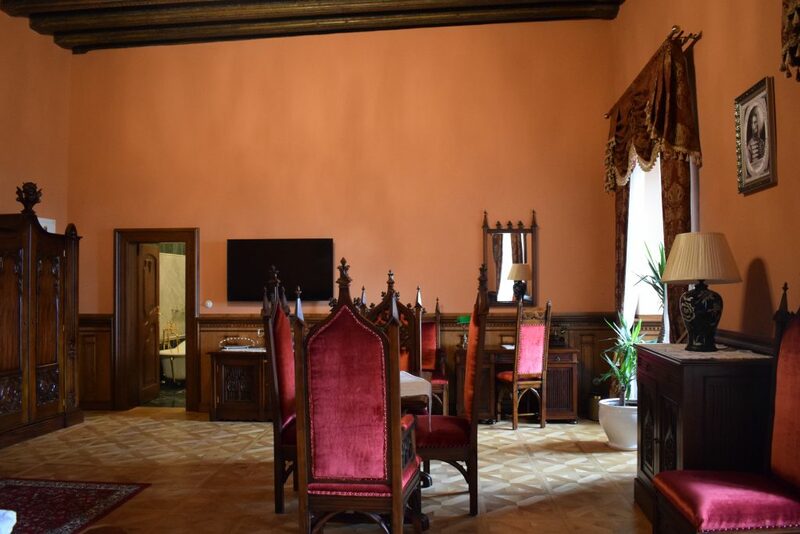 The original firm castle walls of stone, brick arched walls and wooden floor guarantee to the guests a permanent presence of the castle atmosphere. Low-located windows add to the room an interesting lighting which is completed by the light from a heavy brass chandelier. 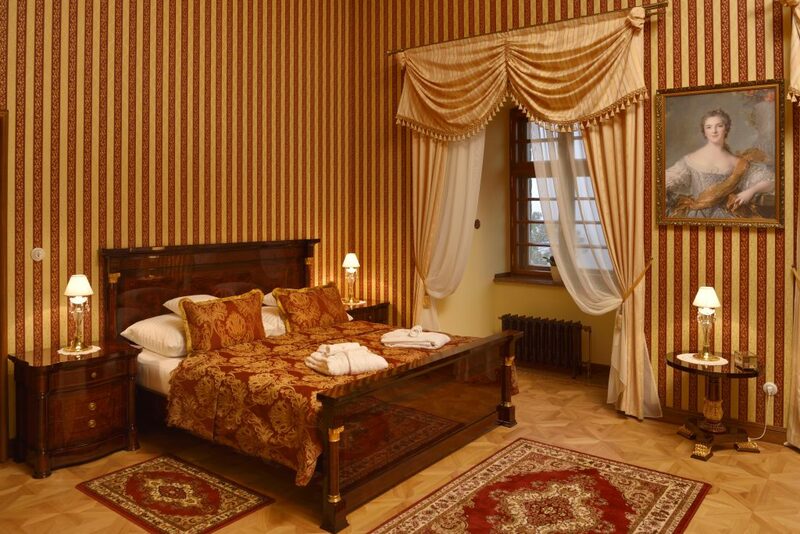 The room is furnished in Renaissance artistic Style and its dominant feature is a beautiful large bed with baldachin. A rich decorating is characteristic for the Renaissance furniture with composing the elements of building architecture into it. In the upper part the wardrobe is completed by a cornice, the door of wardrobe remind an arched decorated portal and the little legs copy a shape of decorated columns. The Renaissance decoration is presented by a front in form of palace facade and by the balustrade legs of bed reminding a railing of Renaissance palaces. 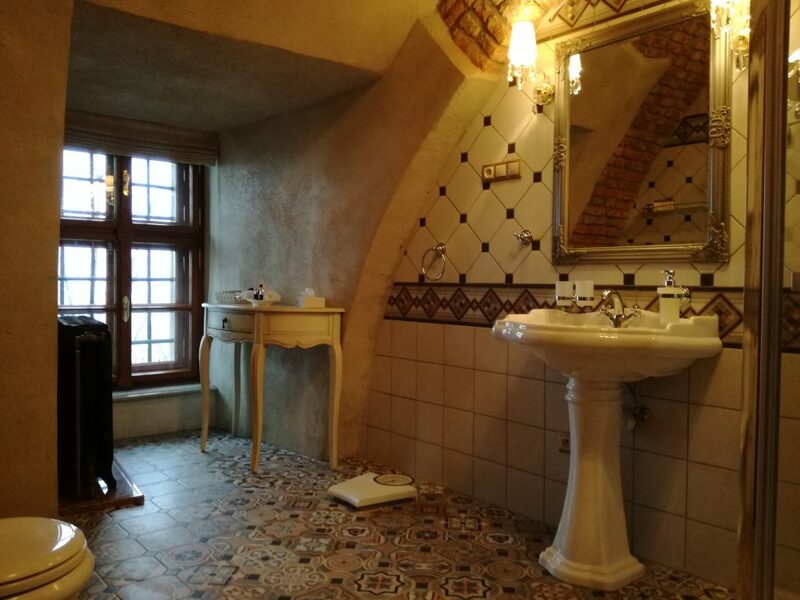 The individuality of room is bathroom with interesting harmony of the original castle walls, beautiful ornaments on the pavement and of decorative figure on the ceramic lining. 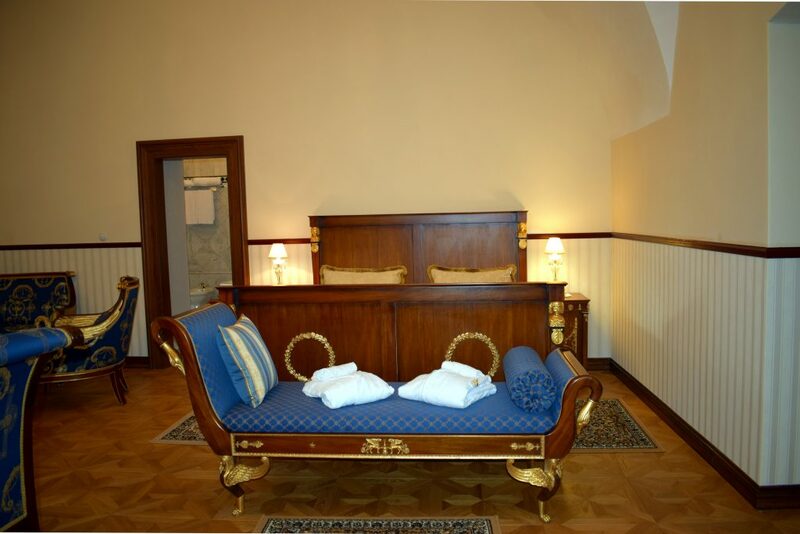 The Deluxe Double room LOUIS THE GREAT is found in frontal part of the south-west castle wing. Locating on the ground floor secures to the guests a quick access to castle hall, restaurant, reception desk but also to wellness and wine tavern. The orientation of windows to south-west side secures not only a pleasant lighting but also a nice outlook of South-Slovak hollow and Ostrôžky mountain range. This room is one of the three rooms furnished in the Empire Classicist Style which was spread during the Napoleon’s government in France and it is typical by huge, perfect shapes, high glare and composing the ancient elements of brass, bronze or gold into it. Silk or fine wallpapers with stripped pattern on the walls are characteristic for the Empire Style. 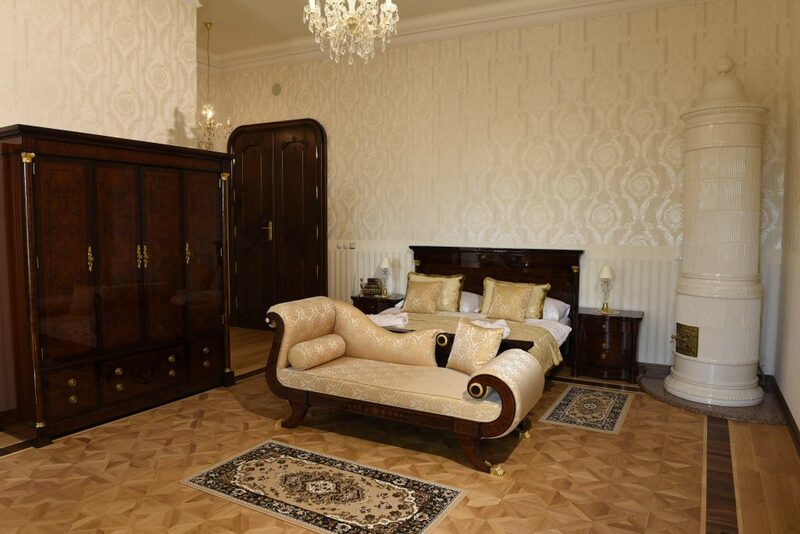 The room is furnished by a plenty of huge furniture with large glittering surfaces. A wardrobe with mirror door that multiplies magnificence of the room belongs to very favourite element of the Empire furnishings. The furniture is richly decorated by gold-plated elements illustrating the ancient and Egyptian elements. For seating furniture the in woodcarver´s manner manufactured swans, winged sphinxes, lions bearing on their wings not only the elbowrests but also the backrest are typical. 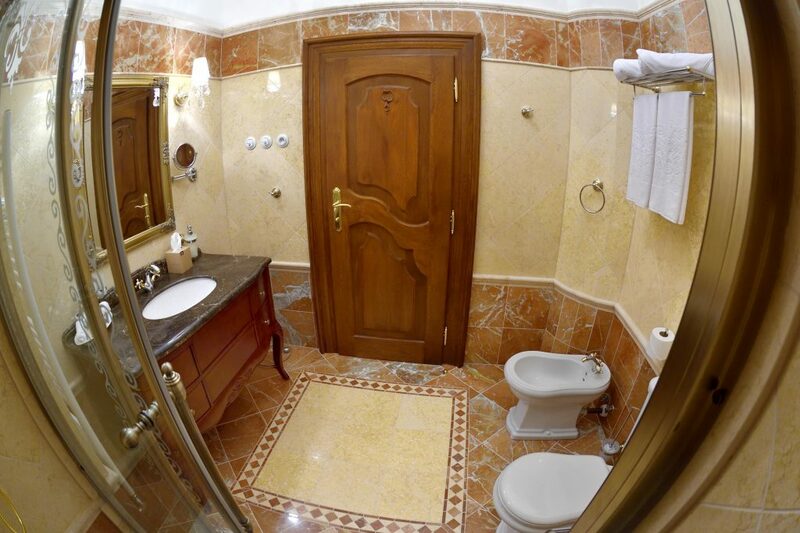 The pompousness of the room is enhanced by spacious bathroom also with gold-plated elements, bath-tub and by the interestingly placed shower cubicle. 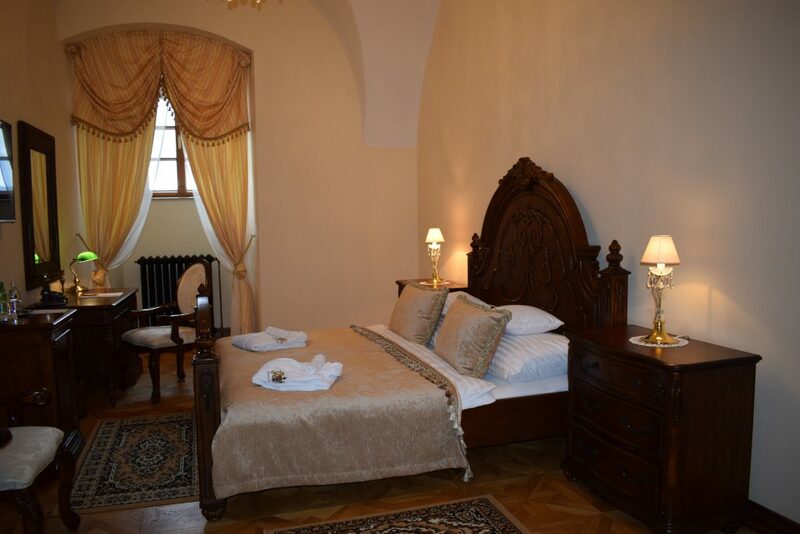 The Deluxe Double room KATALIN PÁLFFY is situated in central part of the south-west castle wing. Placement on the ground floor secures to the guests a quick access to castle hall, restaurant, reception, also to wellness and wine tavern. The orientation of windows to south-west side secures not only a pleasant lighting but also a nice outlook of South-Slovak hollow and Ostrôžky mountain range. 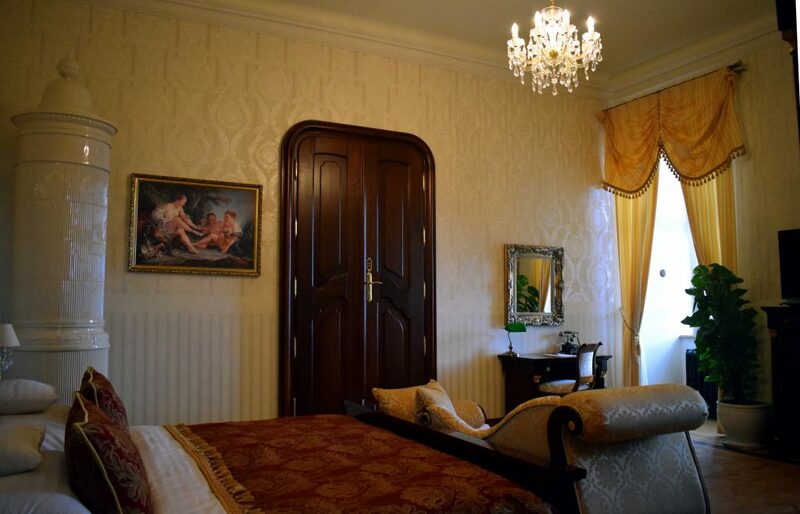 The room consists of entry part, dayroom, bedroom, bathroom and it is furnished in Baroque artistic Style. 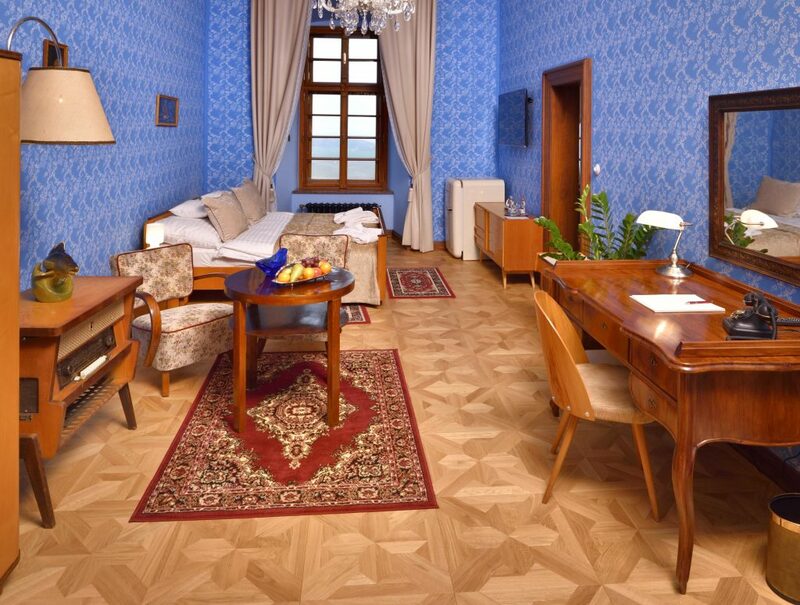 There is a wooden inlaid parquet floor in the room, also carved wooden door and a tower stove oven which are typical elements of interior furnishings in the Baroque period. The Baroque is typical by an overdecoration, pompousness, irregularity, by complicated intertwining lines and shapes. In a Baroque room a large wardrobe with crown cornice and cartouche in its centre must not be missing. 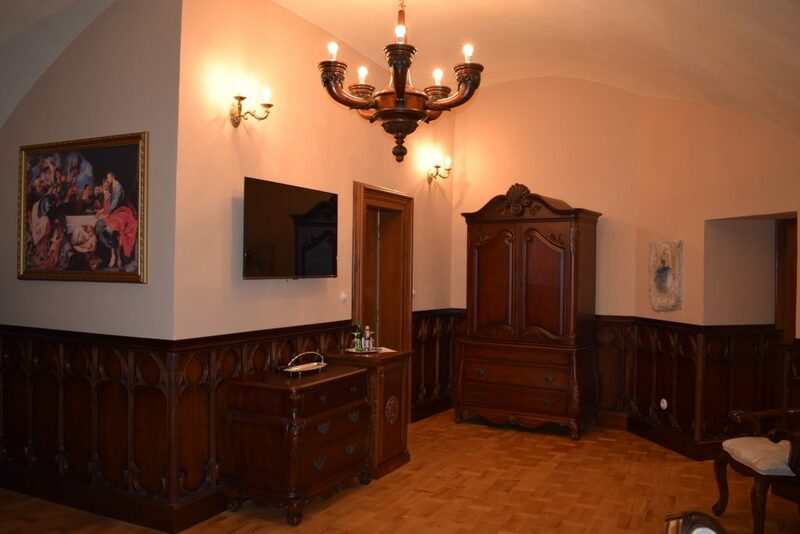 In bedroom a massive wooden bed with volutes on small legs and sideboards and with impressive carved upholstered face is found. In the dayroom a comfort seating with upholstered seat also backrest is situated which is rounded for the sake of higher sitting comfort. The elbowrests also the little legs of seating furniture but also of tables, benches and wardrobes are terminated by woodcarving volutes. 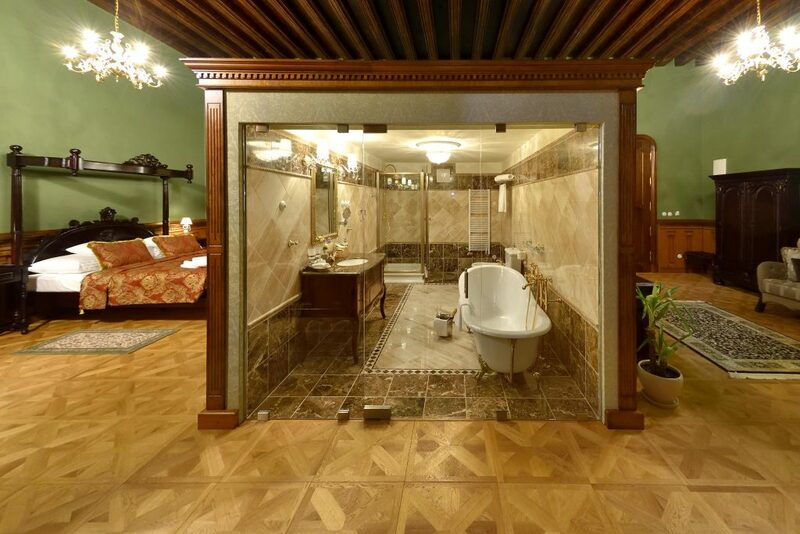 A bathroom belongs to the room with an interesting carved mirror and shower cubicle to which a glazing with framing-up of gold and ornaments adds a historical trace. The light colours of floor and linings are completed by a fine light from hall, penetrating through a higher set window. The Deluxe Double room JÁNOS FORGACH room is situated in central part of the south-west castle wing and the bedroom is placed in the south-west tower. Placement on the ground floor secures to the guests a quick access to castle hall, restaurant, reception but also to wellness and wine tavern. Orientation of windows to the south-west side secures not only a pleasant lighting but also a nice outlook of South-Slovak hollow and Ostrôžky mountain range. 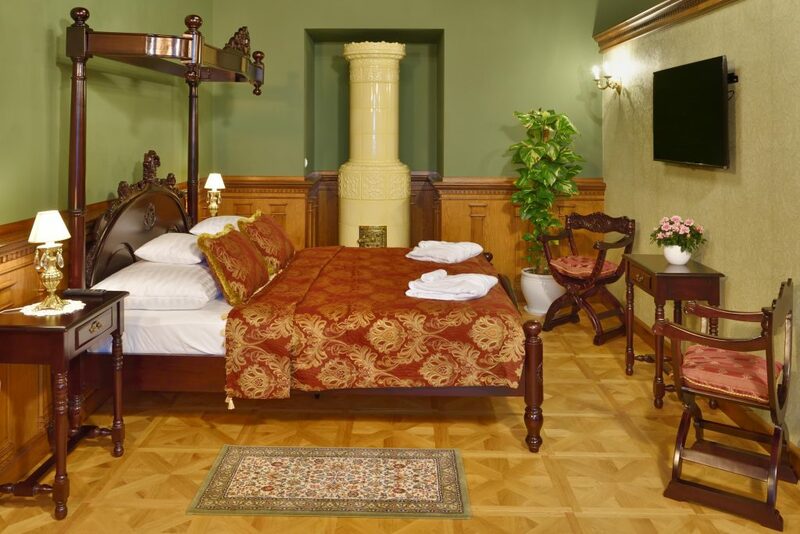 The JÁNOS FORGACH room is the largest room of the castle hotel which consists of grandiose dayroom, spacious bedroom and also of large bathroom and it is furnished in Baroque artistic Style. The Baroque is typical by an overdecoration, pompousness, irregularity, complicatedness and intertwining of lines and shapes. 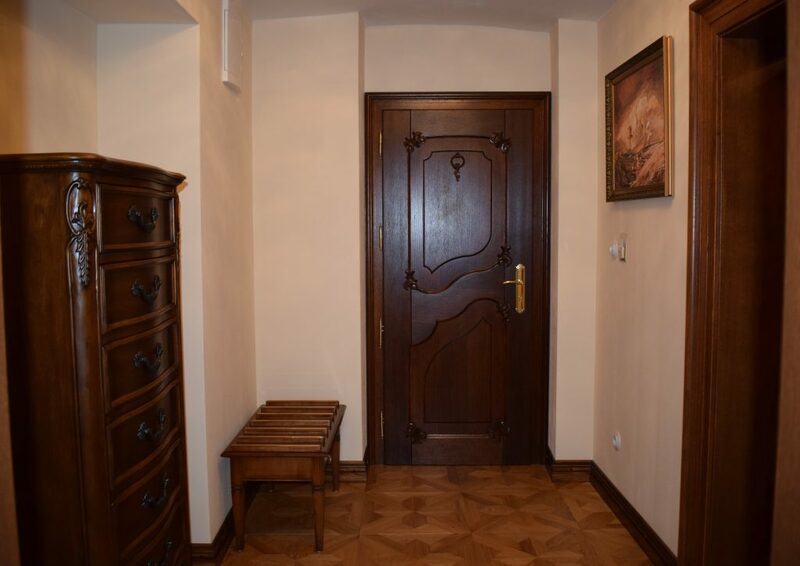 In the entire space there is wooden inlaid parquet floor with star pattern and carved wooden door. The bedroom door is completed by a stained-glass filling in upper part and a decorated tower stove oven is also found here. 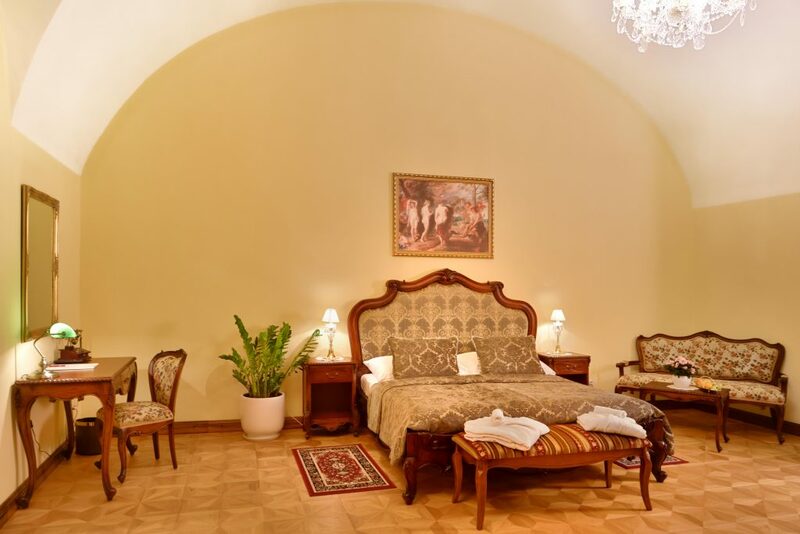 Renovated original cross-shaped ceiling vaults in dayroom and also in bedroom, which highlight a high castle ceiling and at the same time they add to the space fine shapes and Baroque decorativeness, are an architectonic interesting thing. In dayroom there is a large carved wardrobe with crown cornice and cartouche in its centre. A comfort upholstered seating with gold-plated small legs ended by Baroque carved volutes is available to the guests. A rectangular negotiating table with Baroque carved sideboards, little legs and with gold-plated ornaments are situated also here. The sitting at the negotiating table with a mirror in beautiful carved frame of gold secures to the guests a view of action in the whole dayroom, also when sitting towards the wall. A massive wooden bed with volutes on small legs and sideboards, with impressive carved upholstered face and luxury textiles is found in the bedroom. Wall pictures, crystal chandeliers and heavy theatrical curtains with borders and tassels of gold add a pompousness to the entire room. 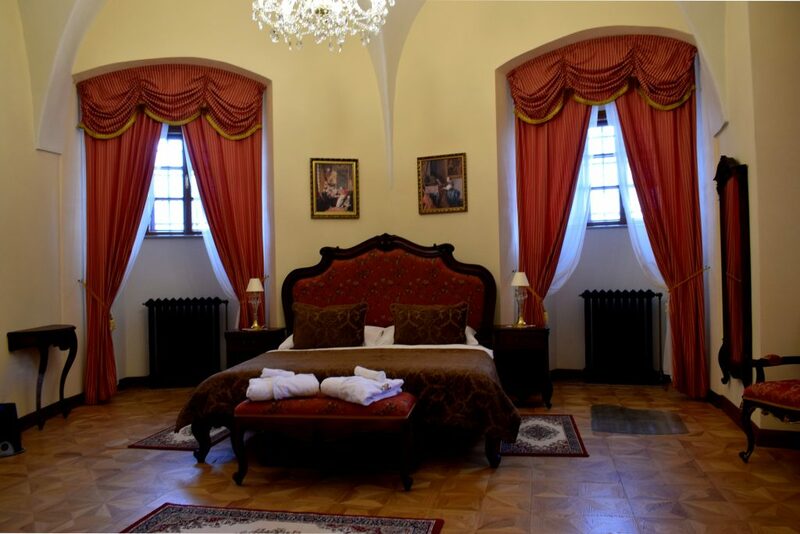 The Deluxe Double room ANNA LOSSONCZY is situated in central part of south-west castle wing. Placement on the ground floor secures to the guests a quick access to castle hall, restaurant, reception, also to wellness and wine tavern. The orientation of windows to the south-west side secures not only a pleasant lighting but also a nice outlook of South-Slovak hollow and Ostrôžky mountain range. 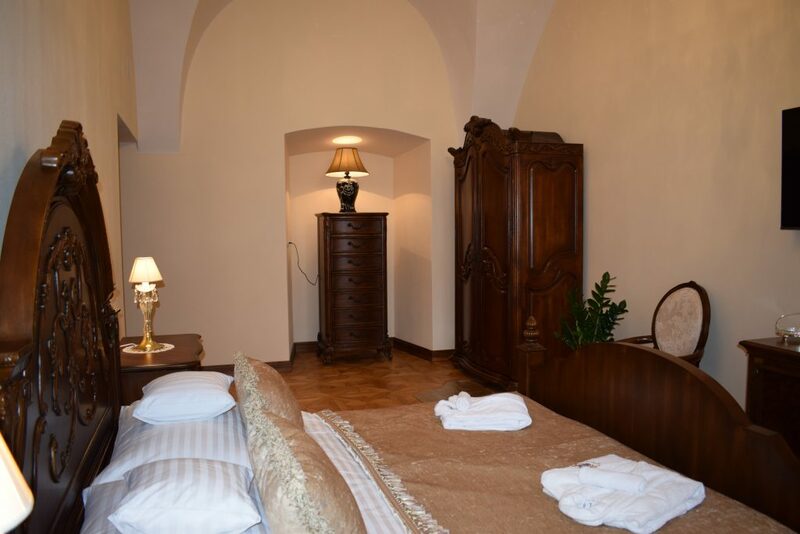 The room is very cosy, in light pleasant colours and it is furnished in Baroque artistic Style. 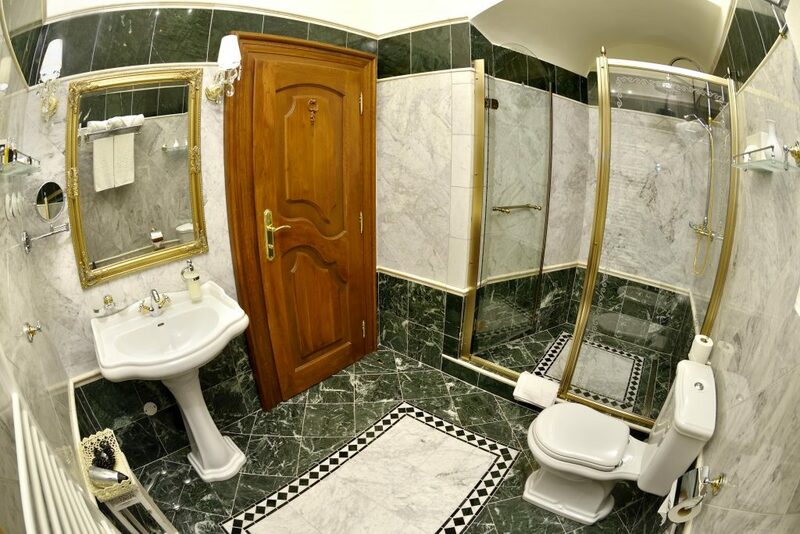 It consists of a separate entry room, main guest-room and bathroom. Renewed cross-shaped ceiling vault in main room, which highlights a high castle ceiling and at the same time add to the space fine shapes and Baroque decorativeness, is an architectonic interesting thing. A beautiful massive bed with carved face in arched shape with decorating cartouche in its centre dominates in room furnishings. 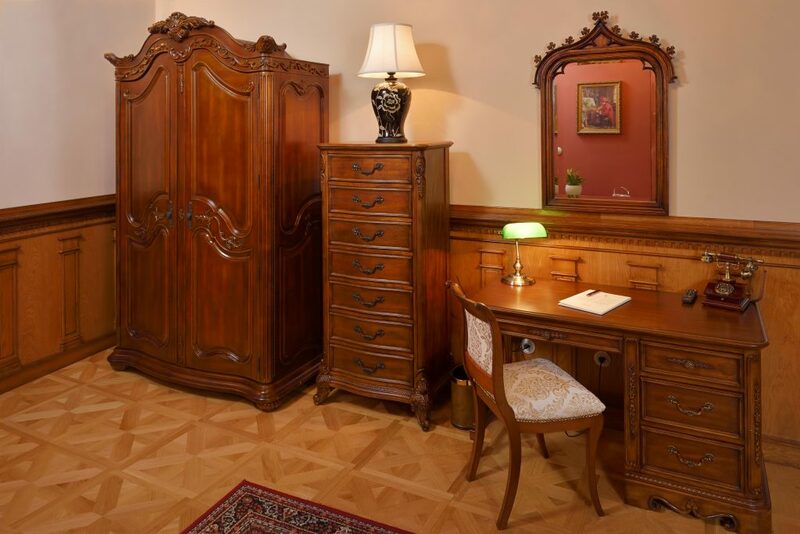 In room there is a large carved wardrobe with crown cornice and ornamental carving in its centre which is identical with carving at the face of bed. A comfortable seating has a upholstered seating part and the backrest is rounded owing to higher comfort of sitting. The elbowrests also little legs of seating furniture but also of tables, benches and wardrobes are terminated by carver´s volutes. The cosiness of room emphasizes the light falling from crystal chandelier and the daylight penetrating at the same time in-between the impressive air curtains with border of gold and tassels. The bathroom has an individual atmosphere in which the light colours also prevail in harmony with sufficient pleasant lighting penetrating trough big window. A stone marble paving in undisturbing tones is bordered by a likeable brown border with a pattern with which it is also decorated a stone wall lining. 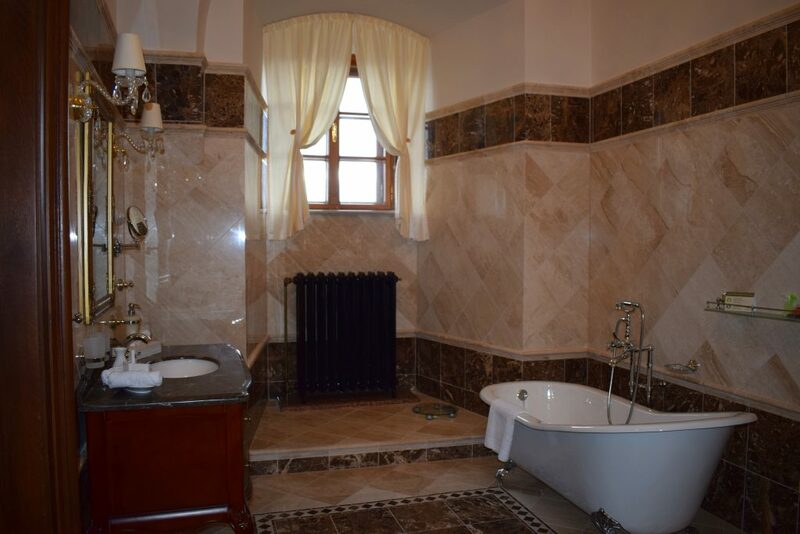 In bathroom there is a premeditatedly placed bathtub where the guest may indulge in undisturbed relax in a pleasant lighting of crystal chandelier and of light reflecting off detailed cornice stucco decoration in circumferential parts of ceiling. 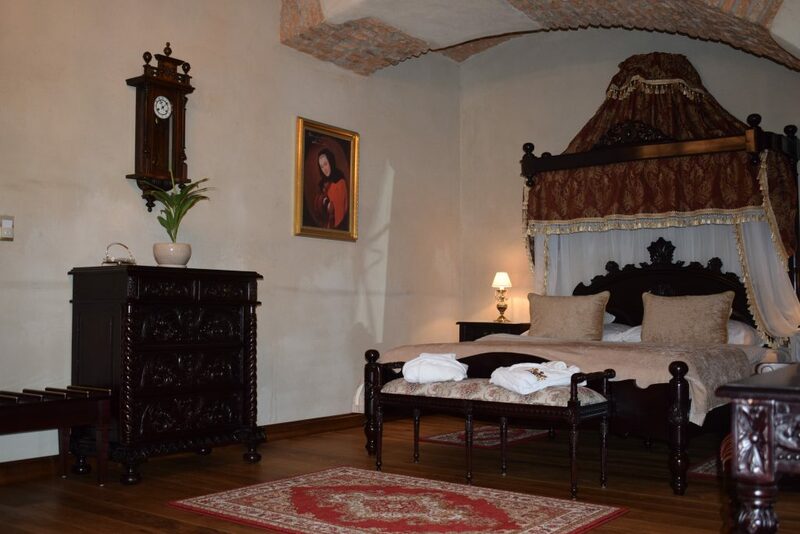 The Deluxe Double room RUDOLF I. is found in the rear north-east part of the castle. A mysterious corridor with stairway leads into the room from castle hall, in corridor only the guests of the room have access. 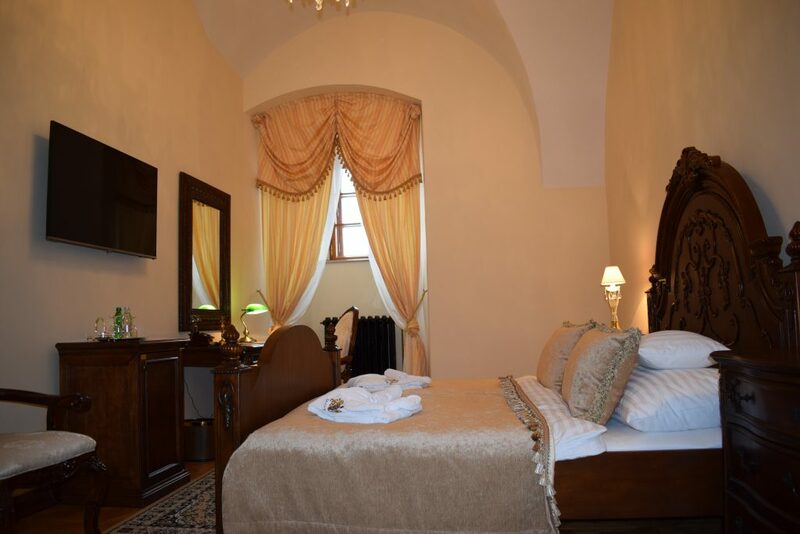 The room is situated in tight proximity of the castle hall with quick access to restaurant, wellness also wine tavern. Over the room there is the Good Shepherd castle chapel. A smaller wooden stairway with handrail leads from entry part into the dayroom. The handrail is decorated with one of the Gothic elements, with biflame in a ring. A dark carved lining with broken arches and typical Gothic traceries, a wooden inlaid floor with simple pattern and a lower arched ceiling with a wooden massive chandelier, with candles are depicting a heavy mediaeval atmosphere. A massive and lower furniture with impressive carvings and decorated forged grips are found in the dayroom. 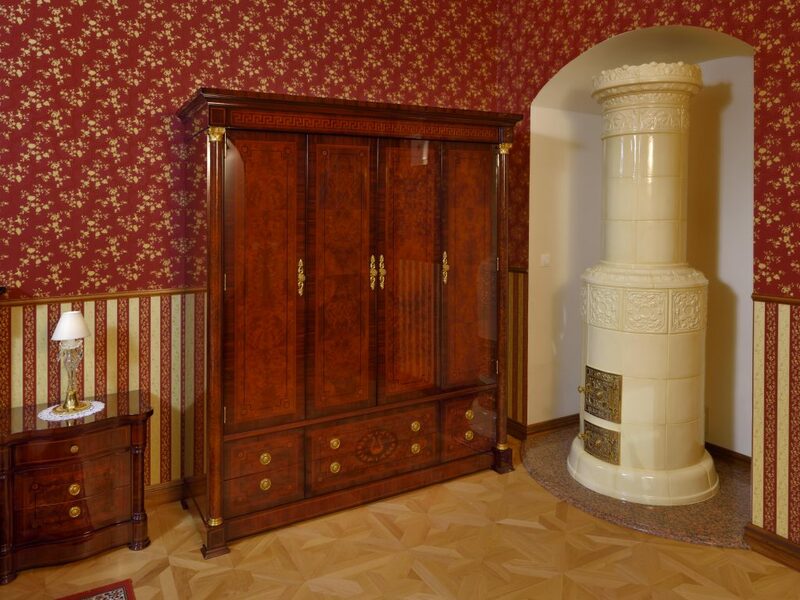 A large matrimonial bed with a high carved front and tower-shaped columns, which are massive, firm and beautifully decorated by climbing plant ornaments, dominates in space of bedroom. Darker curtains on smaller windows and a heavy brass chandelier complete a heavy style of furnishings. 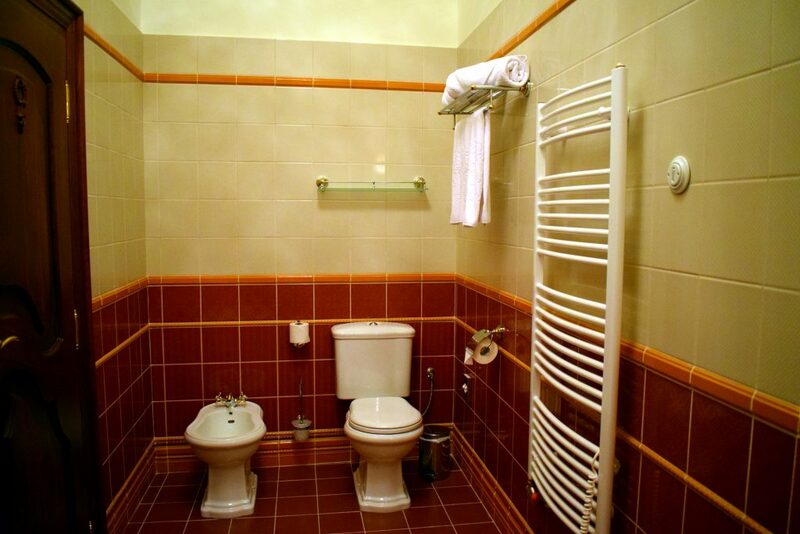 The bathroom with a spacious shower cubicle and arched wall, connecting the ceiling also side wall, has an individual atmosphere. A stone marble pavement in undisturbing tones is bordered by a likeable darker bordure with a pattern with which is also decorated the stone wall lining. A separate entry from the hall through a lower wooden door with small window and forged grating leads into the room. The guests also can get to the room through a separate entry directly from the exterior, from former moat which had been around whole castle. At the reception the guests will get the keys of this door and so they can get, not being observed, inwards or out of the castle. 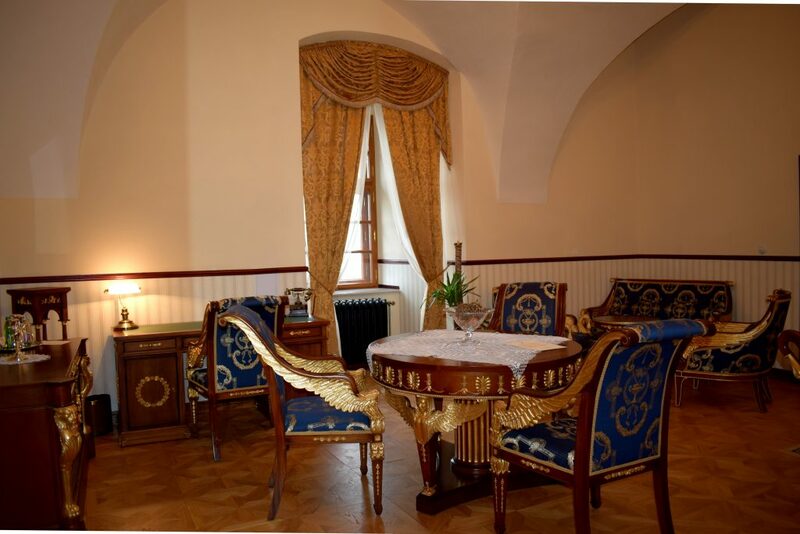 The Deluxe Double room WENCESLAUS III is situated on first representative floor in frontal part of the south-west castle wing and it neighbours with the most ostentatious royal apartment. 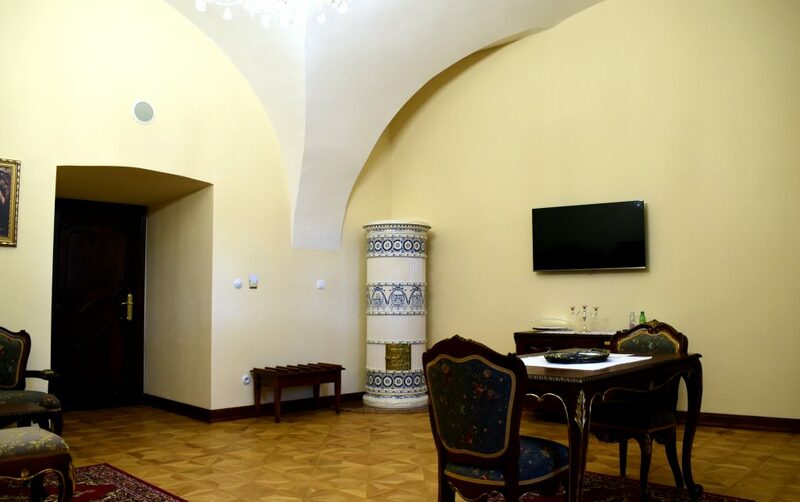 The room position in proximity of the main castle stairway secures to the guests a quick access to castle hall, restaurant, reception also to wellness and wine tavern. Orientation to the south-west side secures not only a pleasant lighting but also a nice outlook of the South-Slovak hollow and Ostrôžky mountain range. The spacious room for first look engages everyone by its spaciousness and lightness. The room size is emphasized also by a high ceiling which is bordered by arched vault. 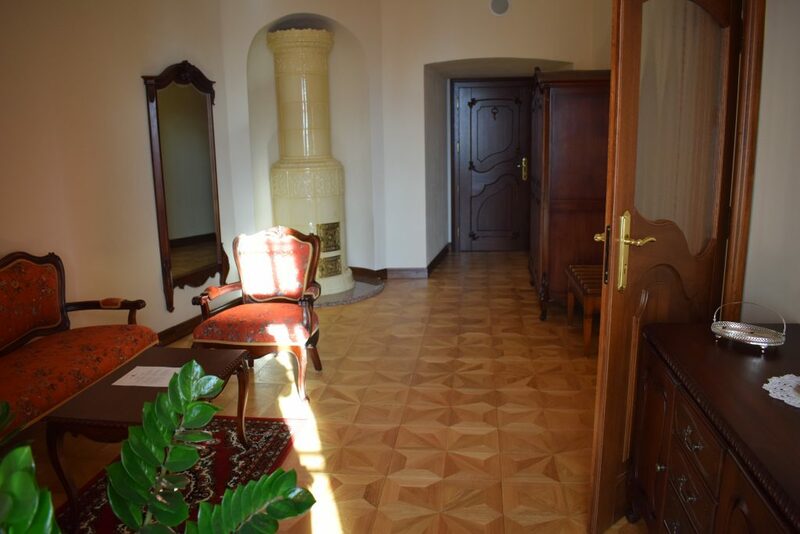 In the room there is inlaid parquet floor, carved wooden door and a tower stove oven which are typical elements of interior furnishings in Baroque period. The Baroque is typical by its overdecoration, pompousness, irregularity, by complicated mingling lines and shapes. In a Baroque room a large wardrobe with crown cornice and cartouche in its centre must not be missing. A massive wooden bed with volutes on the small legs and sideboards and with impressive carved upholstered face is found in the room. A comfortable seating is upholstered with flower pattern on the seating part also on the backrest which is interestingly shaped and completed by carved ornaments. 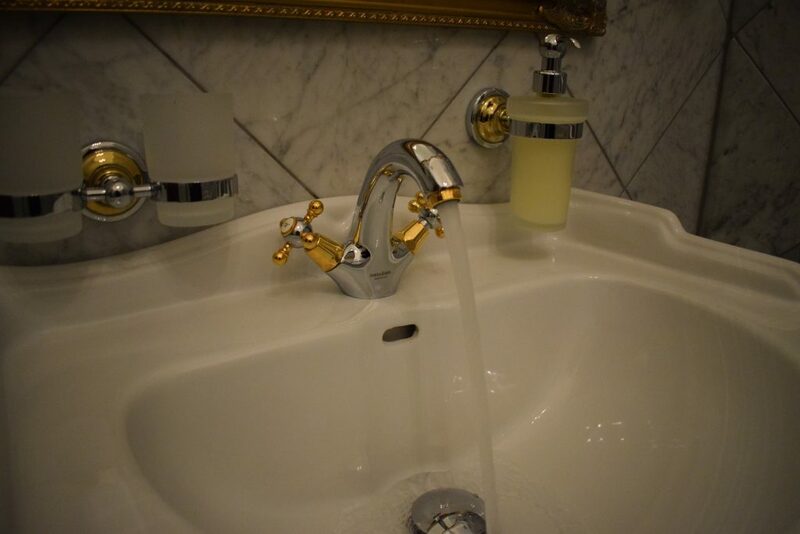 Light tones in combination with marble in emerald colour, which suitably completes the borders on the floor and it is used for lower lining of the walls, prevail in space of the bathroom. A large glazed shower cubicle with sand-blasted ornaments, which is interestingly situated in space of an arched recess, is found here. A carved mirror, gold-plated ornaments and crystal lamps make a Baroque gloss complete. 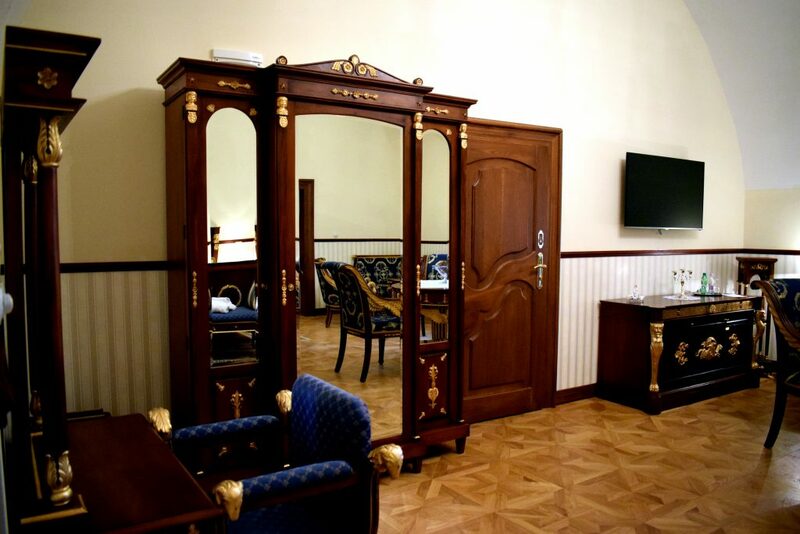 This room neighbours with the Deluxe KAROL ROBERT room with which it is interconnected by common door. So the guests may to order these neighbouring rooms and make use of them like an apartment what is suitable for families with children and relatives, alternatively for small groups of friends. 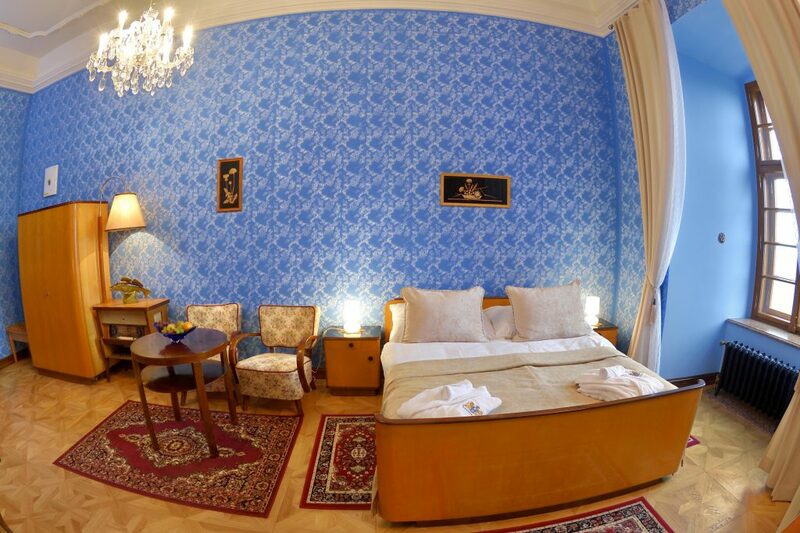 The Deluxe Double room KAROL ROBERT room is situated on the first floor in central part of the south-west castle wing. In its proximity there is the County Hall, the most representative room of the castle hotel. 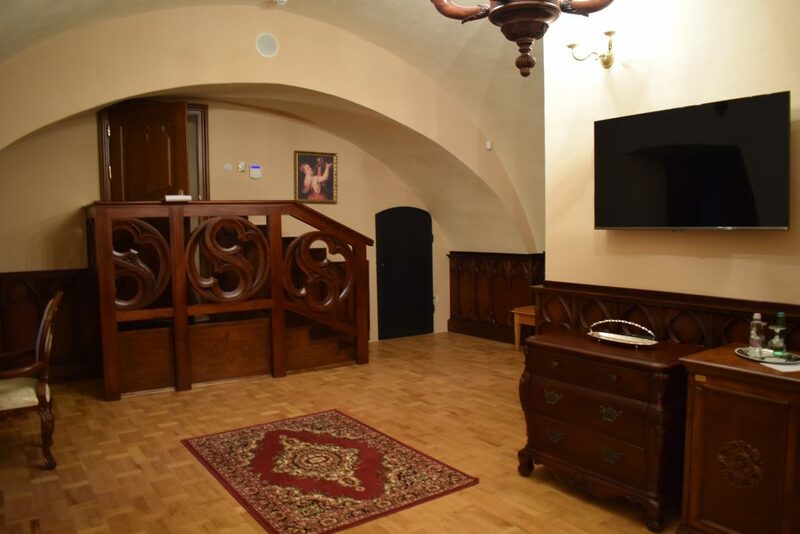 The position of the room in proximity of main castle stairway secures to the guests a quick access quick access to castle hall, restaurant, reception, also to wellness and wine tavern. Large windows secure in the room a pleasant lighting and they provide to the guests a nice outlook of South-Slovak hollow and of the Ostrôžky mountain range. The spacious and light room is furnished in the Empire Classistic Style which is characteristic by huge, perfect shapes, high gloss and by composing the ancient elements of brass, bronze or gold into it. Light wallpapers with stripped and flower pattern are in harmony with room furnishings and with ornaments on the seating furniture and textiles. In the room there is precisely worked-out furniture with perfect shapes, high gloss and gold-plated ornaments which come out of ancient and Egyptian symbols. An inlaid wooden floor with a detailed pattern in square border and the air curtains fitting into the draft of room furnishings by its colorfulness makes complete the representativeness, power and perfection which shall be depicting by the Empire Style. 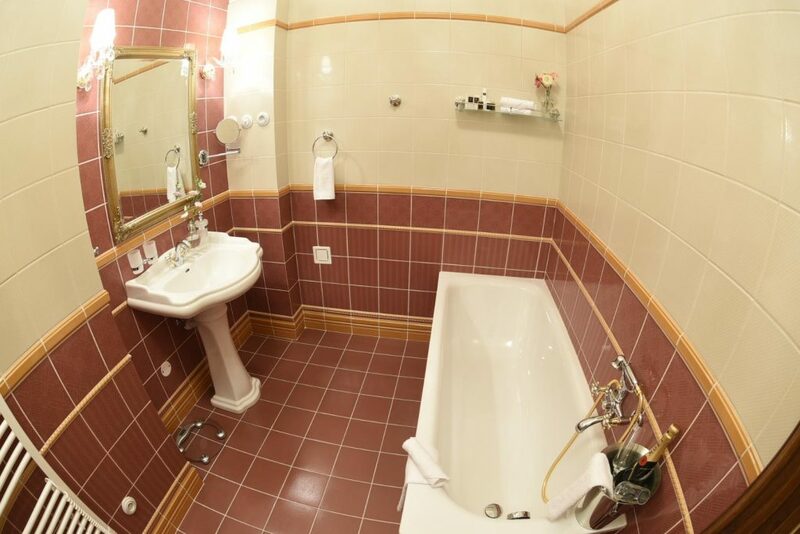 A bathroom with bathtub in live colours of a bright ceramic pavement and of the wall lining belongs to the room. The Deluxe Double room LADISLAUS I found on the first floor in central part of the south-west castle wing. 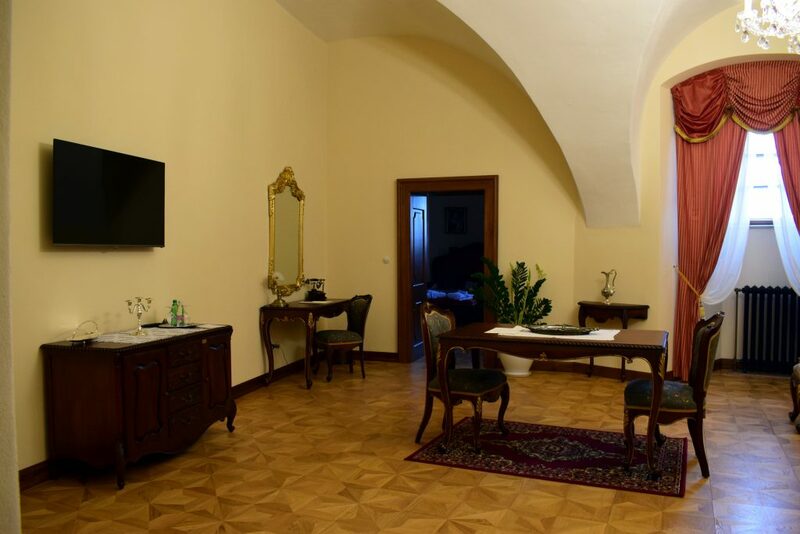 The room position in the proximity of a side renovated castle stairway enables to the guests a quick access to castle hall, restaurant, reception, also to wellness and wine tavern. Also an Good Shepherd castle chapel is easy accessible by this stairway. Large windows secure in the room a pleasant lighting and they provide to the guests a nice outlook of South-Slovak hollow and of the Ostrôžky mountain range. 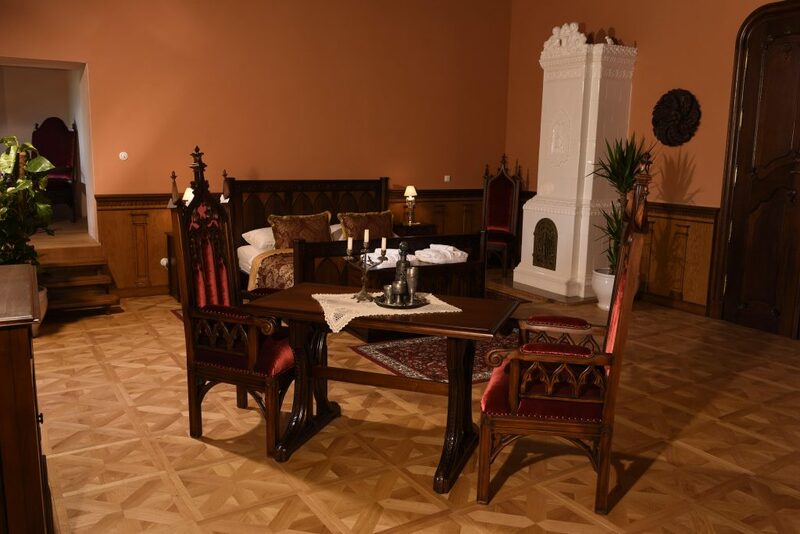 The room belongs to the largest rooms of the castle hotel and it is furnished in Gothic Style which arose in twelfth century in France and it was spread up to the end of 15th century into the North and Central Europe. The slenderness of shapes upward is a characteristic sign of Gothic Style. 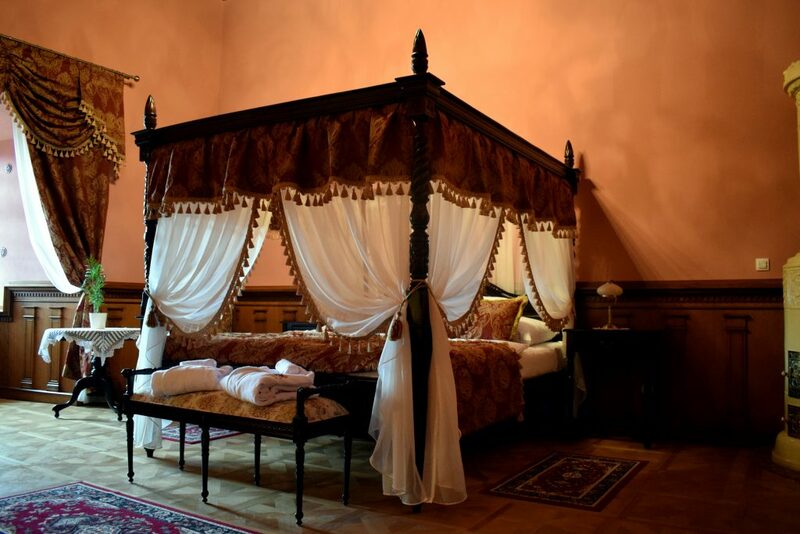 A matrimonial bed with a higher frontal also rear face, which decorate the broken arches, that are just typical for the Gothic Style, dominates the room. The basic storage furniture in the Gothic Style period was a chest which does not even miss in this room. The interior is furnished by massive decorated furniture with protruding ornaments which highlight yet more its height. Huge curtains at large windows, colorfulness of upholstering and a high decorated oven with brass door add to the room a heavy Gothic character. A small elevated room, from which the visitors may savour an outlook of castle environs or they may relax here and spend a while with book, belongs to the room. In spite of a more heavy Gothic furnishings in room there is a pleasant gratifying atmosphere which is created by colour walls with wooden lining. 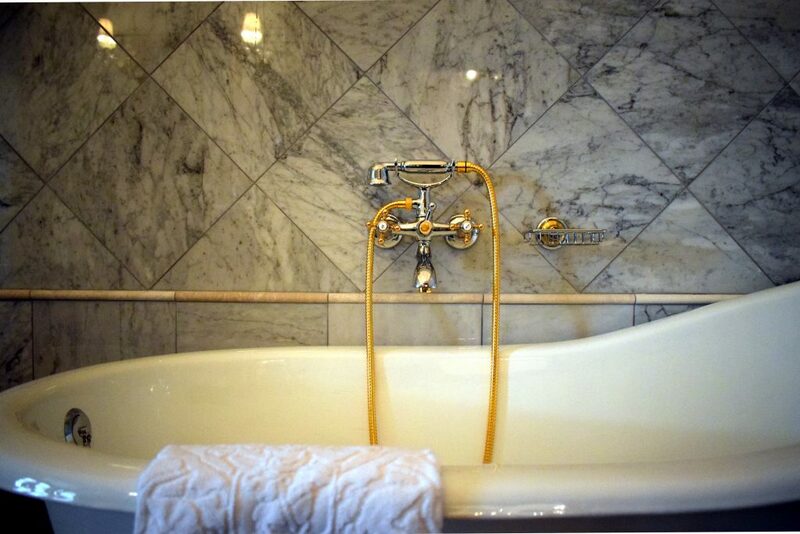 A shower cubicle also a bathtub with small legs of gold are found in spacious bathroom. Light tones prevail in it, in combination with marble in emerald colour which suitably completes the borders on floor and it is used for lower lining of walls. In the room there is a beautiful renovated beam ceiling on which more simple geometrical ornaments are observable. Natural motives like flowers, birds but also the human figures of a man and woman are found on the boards. Beam floors were still preserved in five rooms and they are more than 400 years old. They have been discovered under the plaster during the reconstruction at the turn of the fiftieth and sixtieth years of twentieth century. During the last reconstruction, before opening the castle hotel, the beam floors have been purified and renovated on the basis of research. 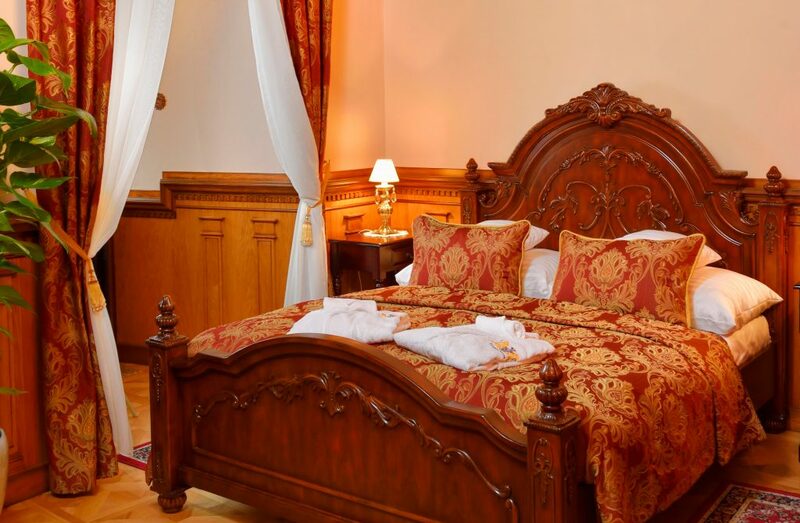 The Deluxe Double room GÉZA I is situated on the first floor in the northern wing of the castle hotel. 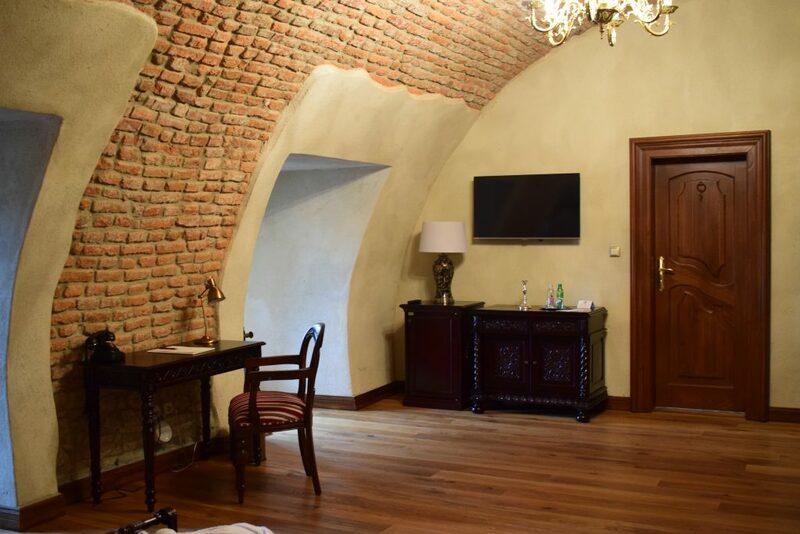 The room is found in the proximity of side castle stairway what secures to the guests a quick access to the castle hall, restaurant, reception, also to wellness and wine tavern. In the proximity of the room there is also the Good Shepherd Chapel. 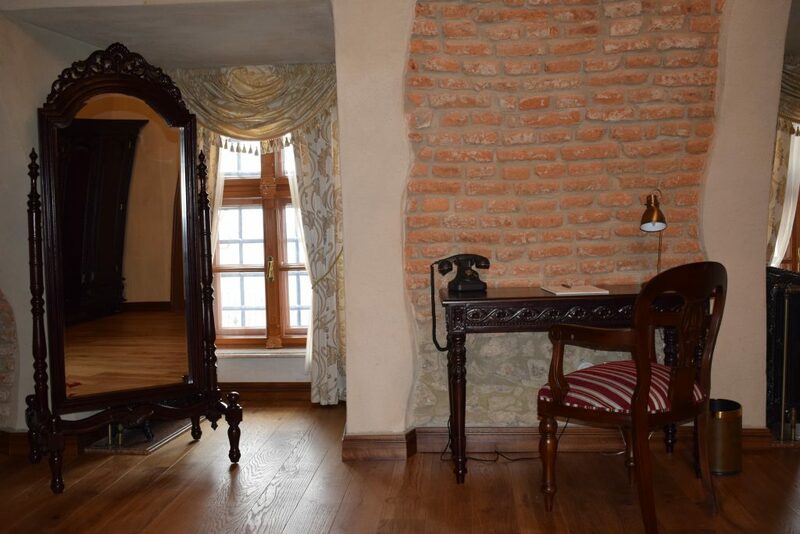 The room orientation offers to the guests a nice outlook of the Ostrôžky mountain range and Revúcka vrchovina highlands. 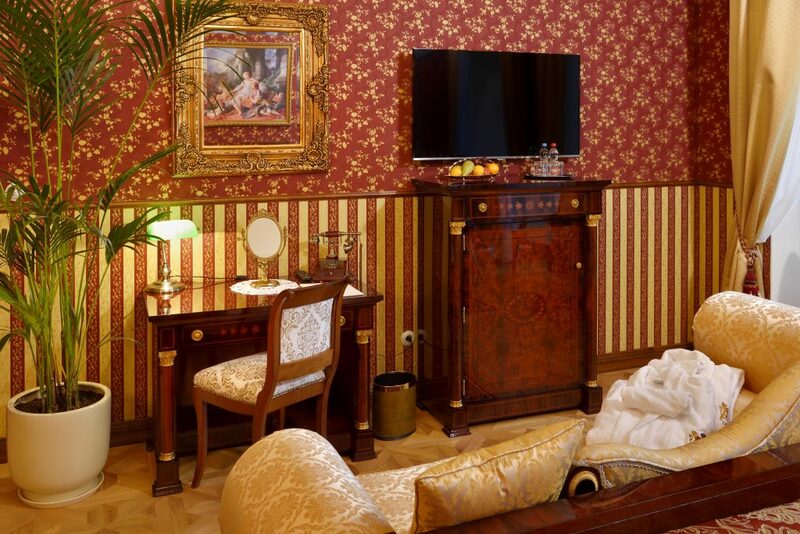 The cosy room is furnished in the Baroque artistic Style in light tones, namely by ostentatious furniture. 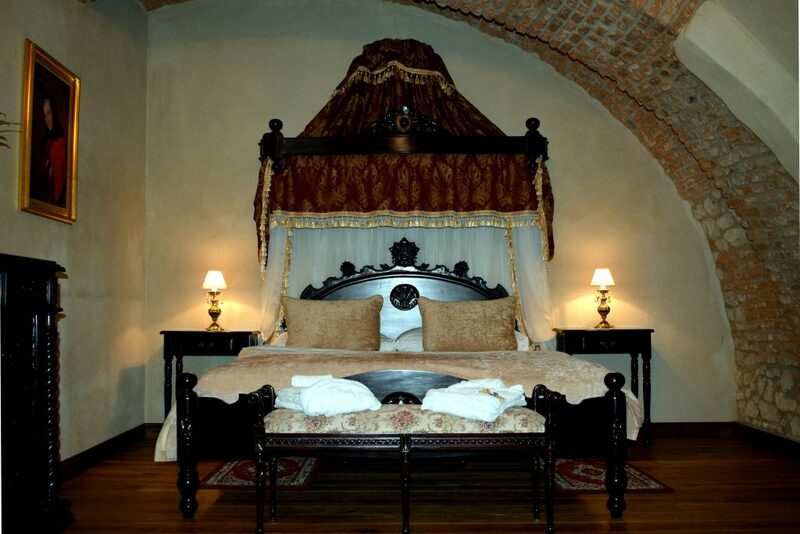 A massive, comfortable matrimonial bed with a beautiful arched carved face with ornament and luxury textiles and pillows are the decoration of the Baroque room. The huge furniture is nicely shaped with interesting carved ornaments and brass or forged shaped grips. Colour walls, wooden floor with an interesting pattern. Impressive lining of walls with detailed pattern and a wooden carved cornice on the premeditatedly composed bathroom in it make a warm atmosphere of his space complete. 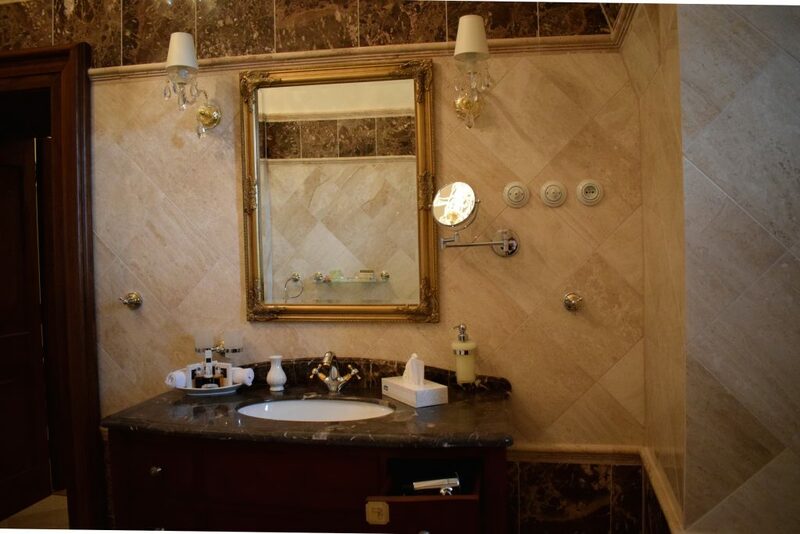 In the space of bathroom with bathtub light tones in combination with marble in emerald colour prevail, which suitably completes the borders on floor and it is used for lower lining of walls. The carved mirror, gold-plated elements, crystal lamps and well worked-out stucco cornice on the perimeter of internal walls make the Baroque gloss complete. 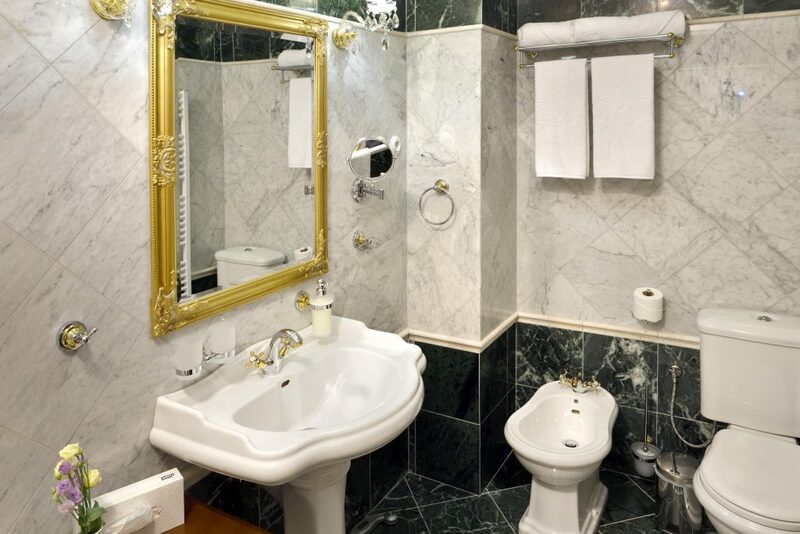 The Deluxe Double room ANTONELLA FORGACH is situated on the first floor in the northern wing of the castle hotel. 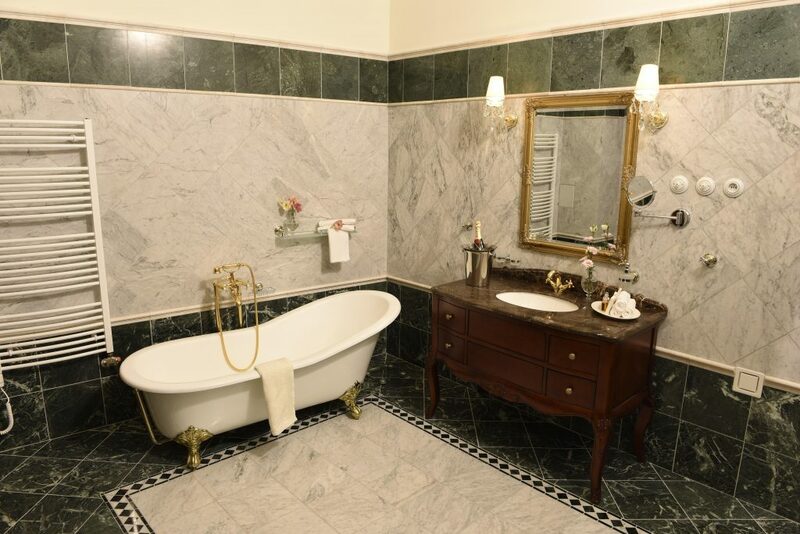 The room is found in the proximity of the side castle stairway and rear lift what secures to the guests a quick access to castle hall, restaurant, reception, also to wellness and wine tavern. In the proximity of the room there is also the Good Shepherd Chapel. Orientation of the room provides to the guests a nice outlook of Ostrôžky mountain range and of Revúcka vrchovina highlands. 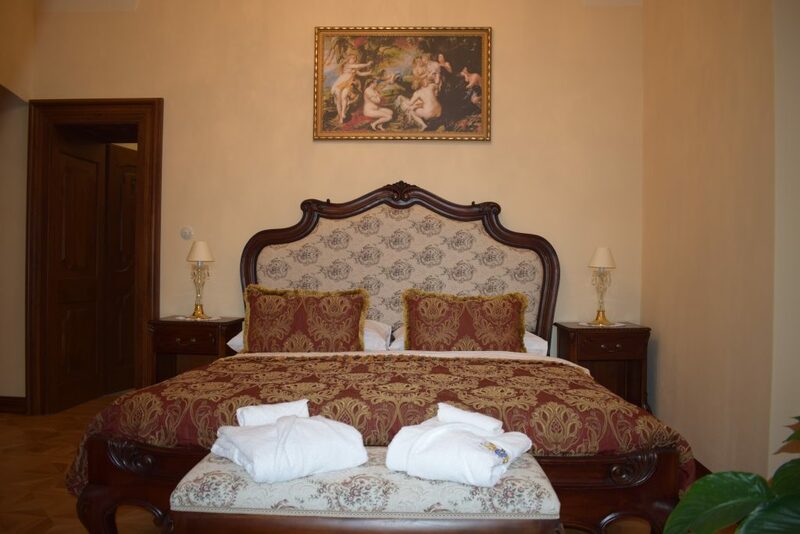 The room is furnished in Renaissance artistic Style and a beautiful large bed with baldachin is its dominant feature. A rich decorativeness with composing-into of the elements of building architecture is characteristic for the Renaissance furniture. The wardrobe is completed by a cornice in upper part, the door of wardrobe reminds an arched decorated portal and the little legs copy a shape of decorated columns. The face in shape of palace façade, carved side pillars and a firm frame with baldachin present the Renaissance decoration of the bed. This frame connects the air romantic curtains and a more heavy draped curtain which matches interior textiles and huge impressive hinges at the window. 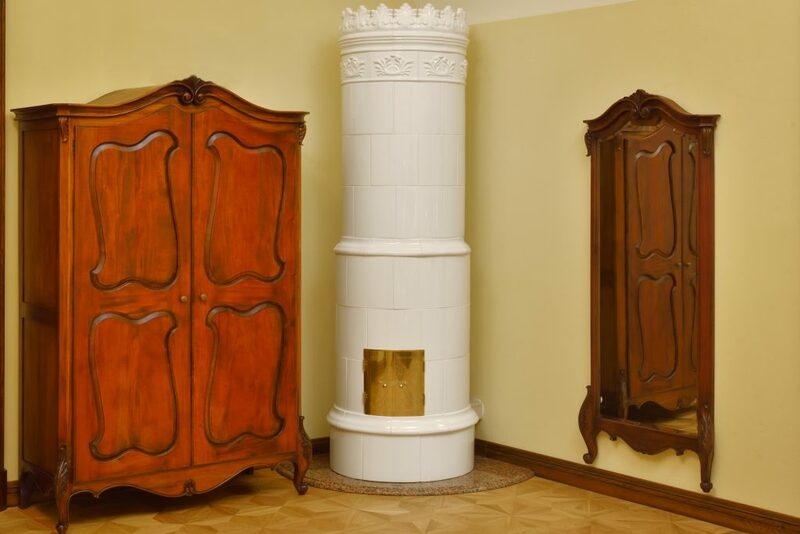 Colour walls, precisely carved lining of walls, wooden inlaid floor with a well worked-out ornament and last but not least an exceptional tower stove oven make complete a gratifying atmosphere in room. 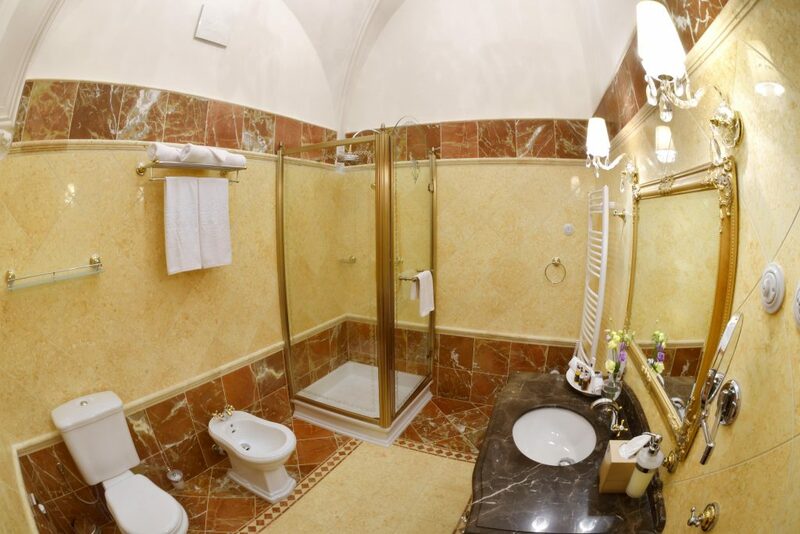 A pleasantly illuminated bathroom with a corner arched shower cubicle with glass walls and sand-blasted ornaments belong to the room. 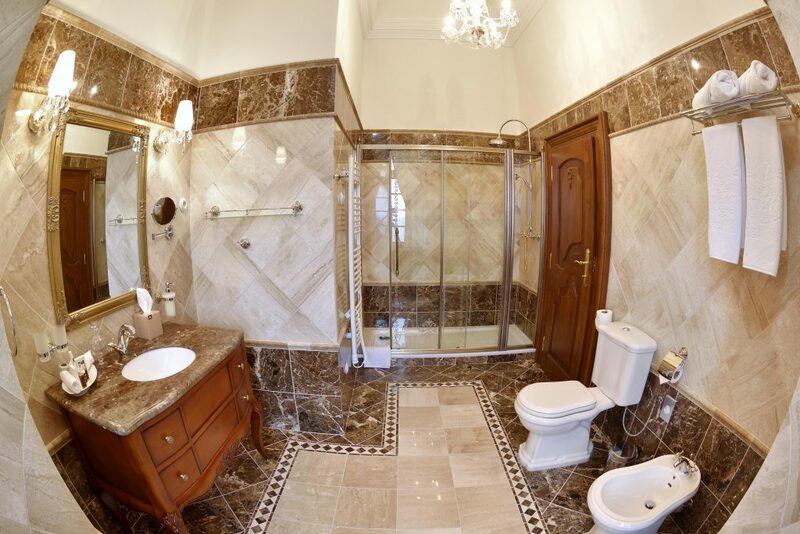 Impressive stone floor and lining in fine colours completed by a delicately darker tone of border with ornament and listels create the individuality of the bathroom. 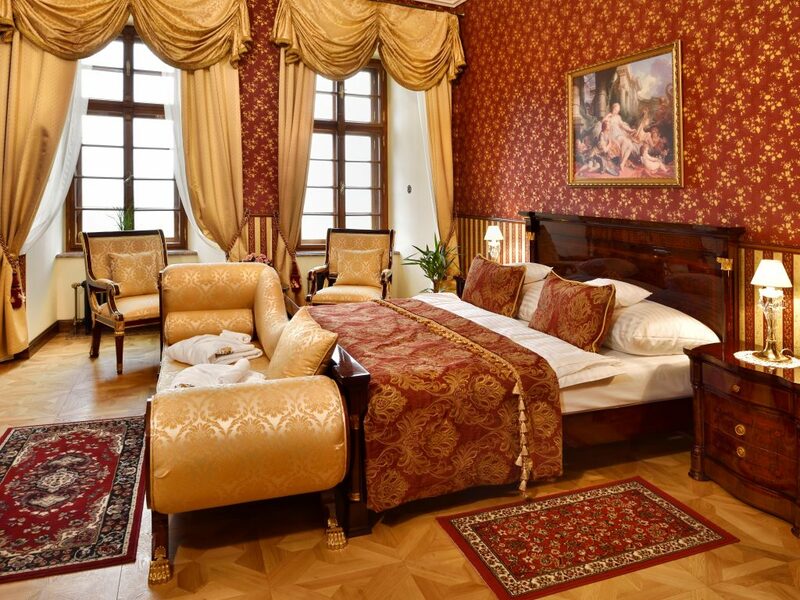 The Deluxe Double room ERZSÉBETH FORGACH is found on the first floor, in rear part of the north-east castle wing. 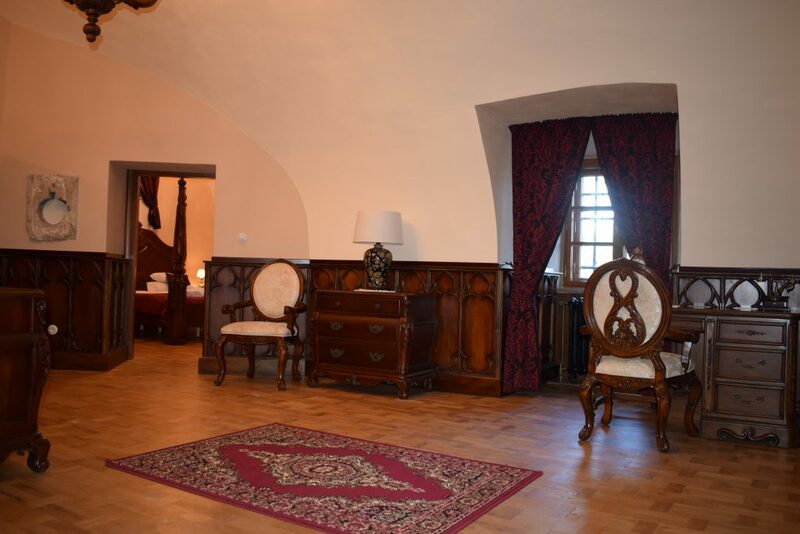 The room is well accessible by lift in the north also north-east wing what secures to the guests a quick access to castle hall, restaurant, reception also to wellness and wine tavern. Thanks to its position it offers to the guests a nice outlook of South-Slovak hollow and Revúcka vrchovina highlands. 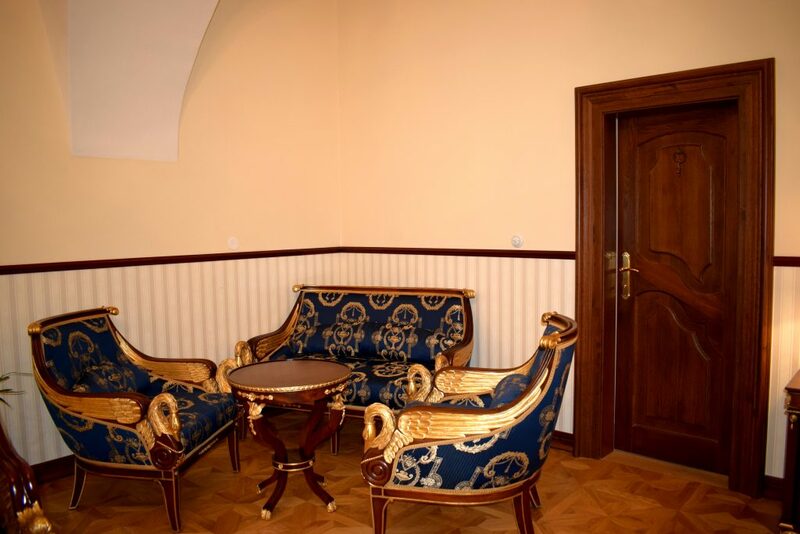 Already at the entry into the room the guests will be bewitched by beautiful furnishings in Classicistic Empire Style, characteristic by its perfection, precision and gloss. 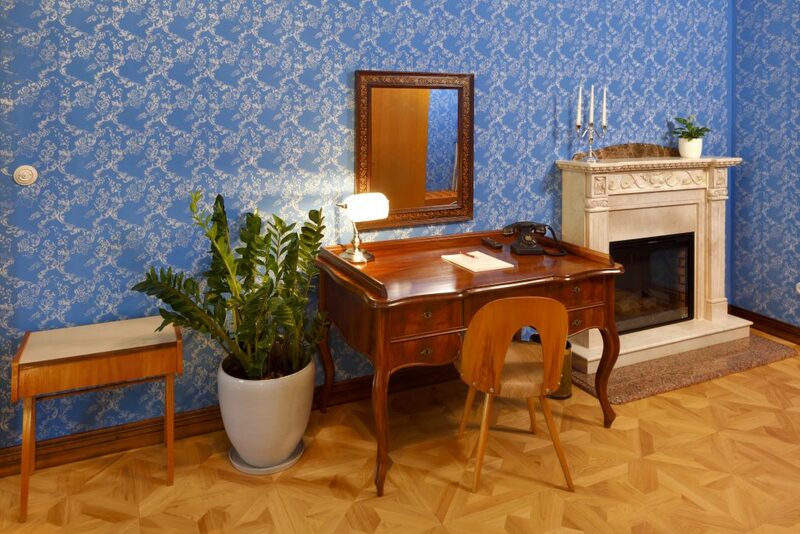 Stripped wallpaper with flower pattern, connecting the golden and red colours, are in accordance with the room furnishings and ornaments on textiles. In the room there is precisely worked-out furniture with perfect shapes, high gloss and gold-plated ornaments which come out of ancient and Egyptian Symbols. Also an inlaid wooden floor with detailed pattern and the air curtains, by its colourfulness fitting in draft of the room furnishings, make the representativeness, power and perfection complete. 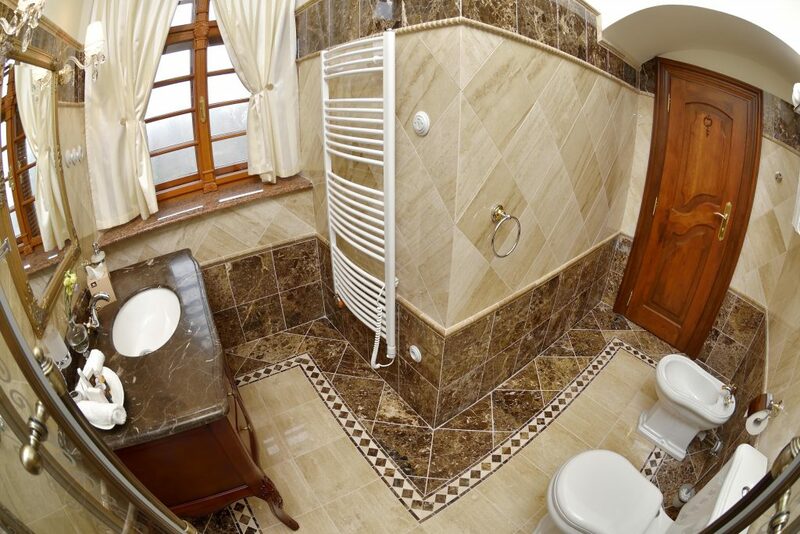 A bathroom with spacious shower cubicle belongs to the room. The live colours of stone floor and of bright linings with perfect undisturbed shapes induct a feeling of variety. 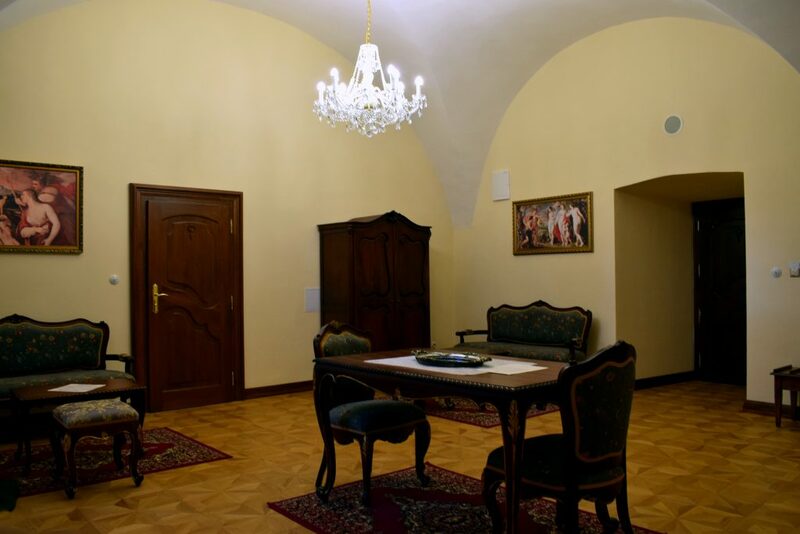 The ERZSÉBETH FORGACH room has besides the separate entry door also a second entrance that is from the common hallway with the Deluxe KING SAINT STEPHEN apartment. So the guests may order the room also apartment and make use them like a large family apartment what is suitable for families with children and relatives, alternatively for small groups of friends. 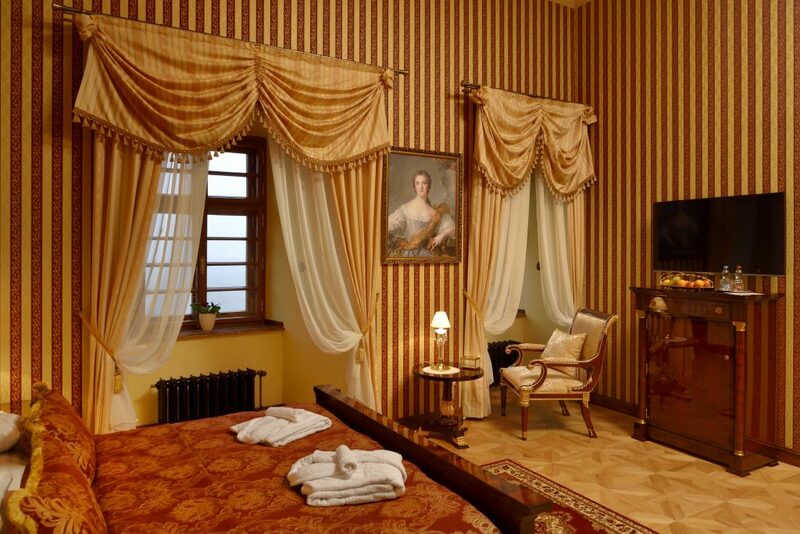 The Deluxe Double room ANTAL FORGACH is situated on the first floor, in central part of the north-east castle wing. 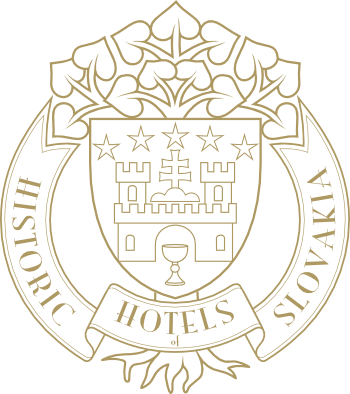 It belongs to the largest rooms of the castle hotel and three big windows offer to the guests a beautiful outlook of castle environs and of vast territory of the South-Slovak hollow and the Revúcka vrchovina highlands. 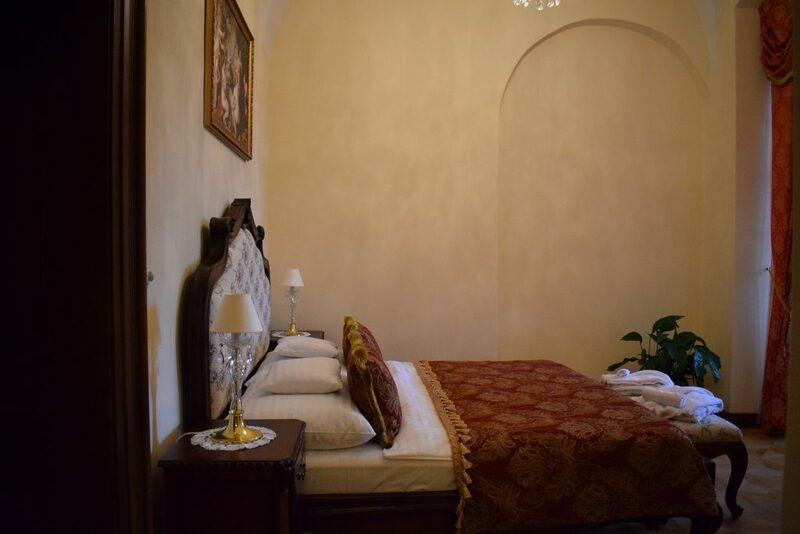 The room is furnished in Renaissance artistic Style and a beautiful large bed with baldachin is its dominant feature. A rich decorativeness with composing-into the elements of building architecture is characteristic for Rennaissance furniture. The wardrobe is completed in the upper part by a cornice, the wardrobe door reminds an arched decorated portal and the little legs copy a shape of decorated columns. A front in shape of a palace facade and balustrade legs of bed reminding a handrail of Rennaissance palaces present the Rennaissance decoration of the bed. In the dayroom there is an elegant and comfortable couch to which a lot of pillows and a brass adornment in centre of backrest add a royal trace. 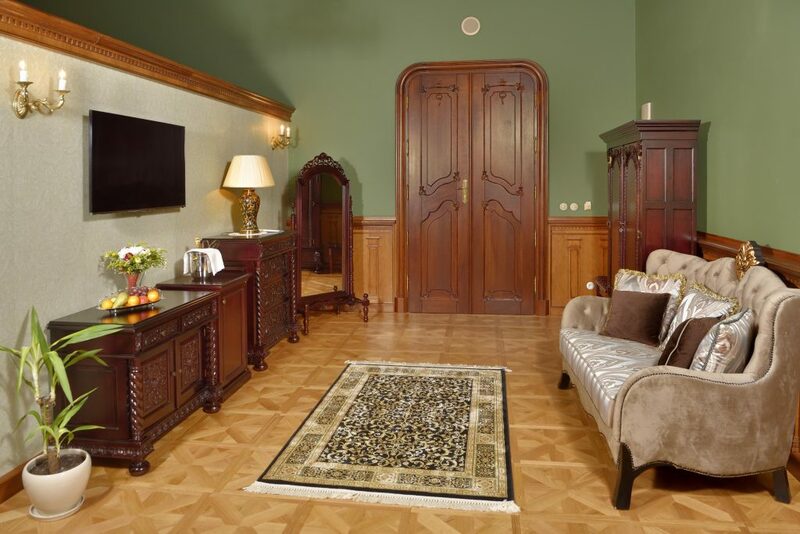 Colour walls, precisely carved wall lining, an inlaid wooden floor with detailed pattern and a renovated beam floor of 17th century create a pleasant castle atmosphere. The daylight, penetrating through three big windows, is completed by heavy brass chandeliers, wall brass light fittings with candles and delectable table lamps. 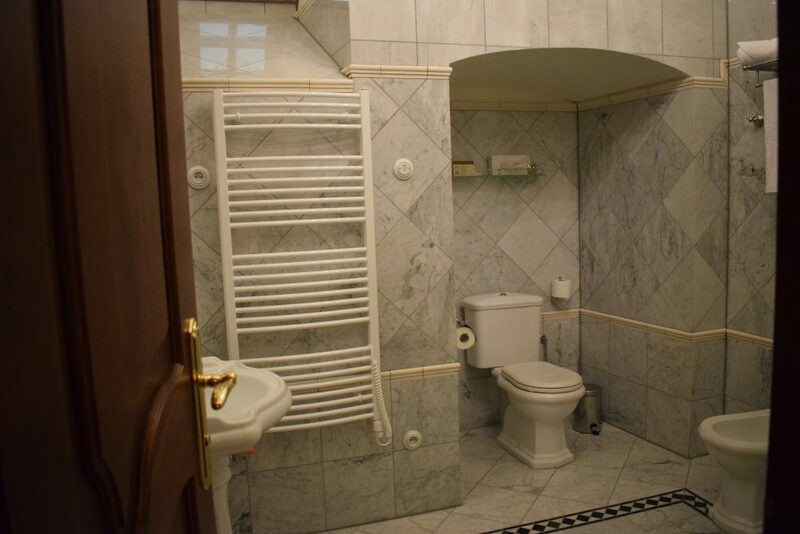 A specifically set bathroom in centre of space is an unique thing by what a separation of bathroom from dayroom was reached. 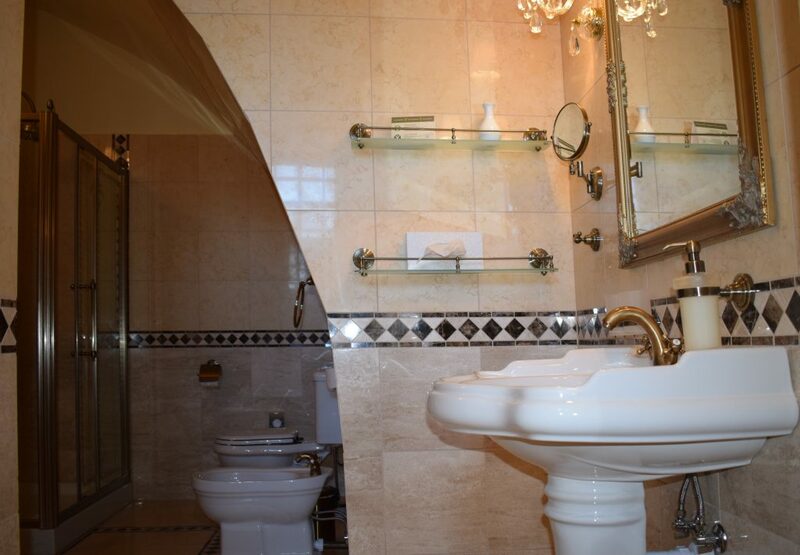 A sufficient lighting of big bathroom is secured by an all-glass wall orientated to windows. 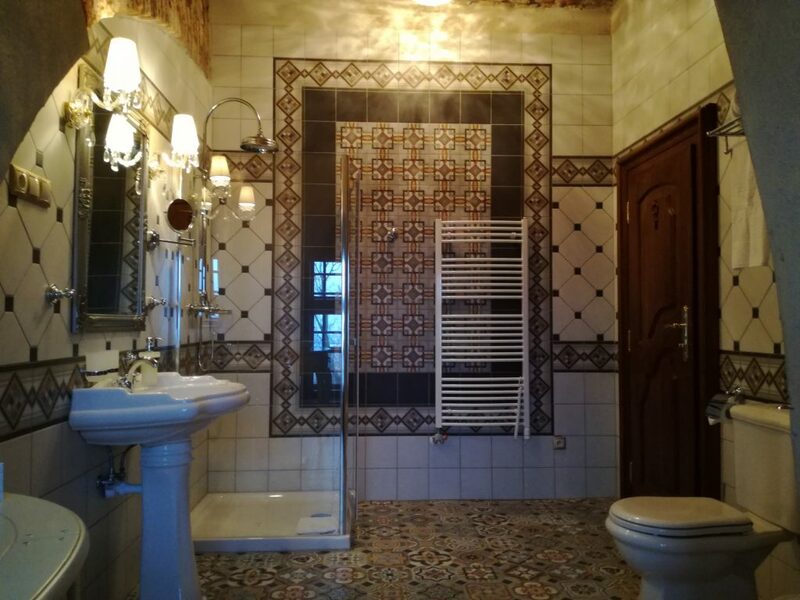 On the outer walls of bathroom there are greenish wallpapers with a luxury flower pattern while the wall corners are strengthened by the wooden carved linings and in the upper part by a carved stepped cornice which is typical for the Rennaissance period. 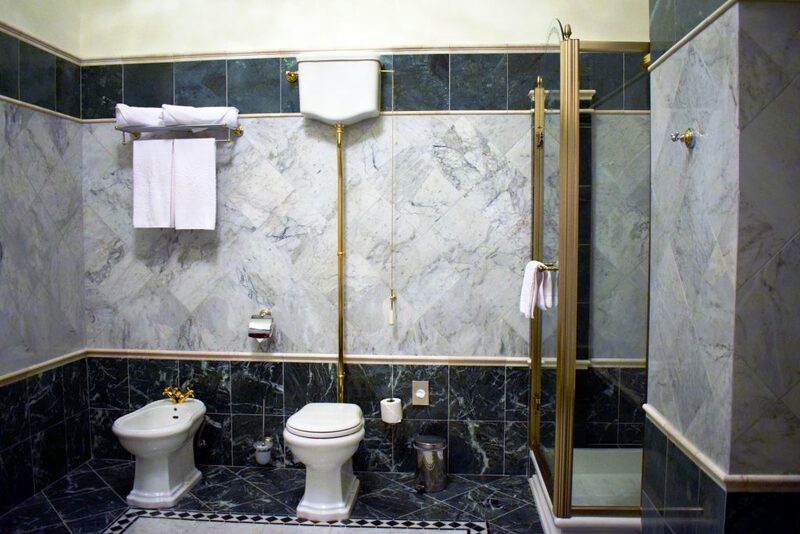 A corner shower cubicle also a tub with small brass legs are situated in the bathroom. 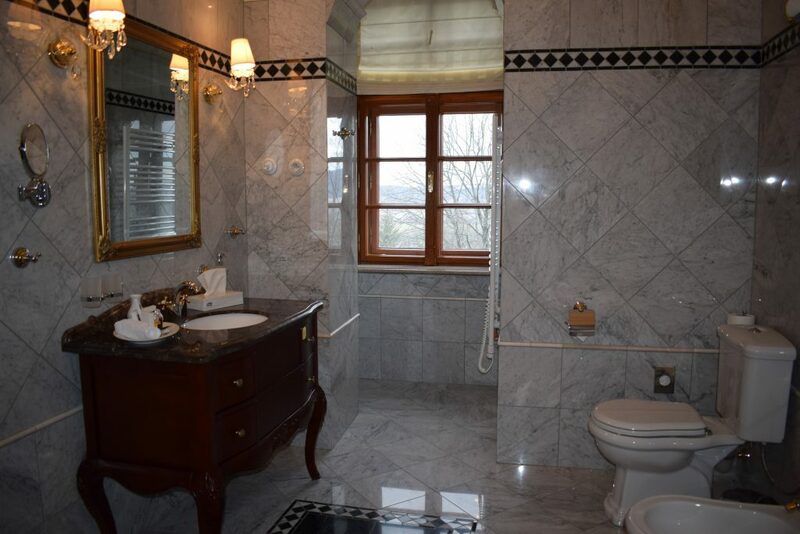 An impressive stone floor and a lining in fine colours completed by a finely darker tone of a border with ornaments and listels underline the individuality of bathroom. 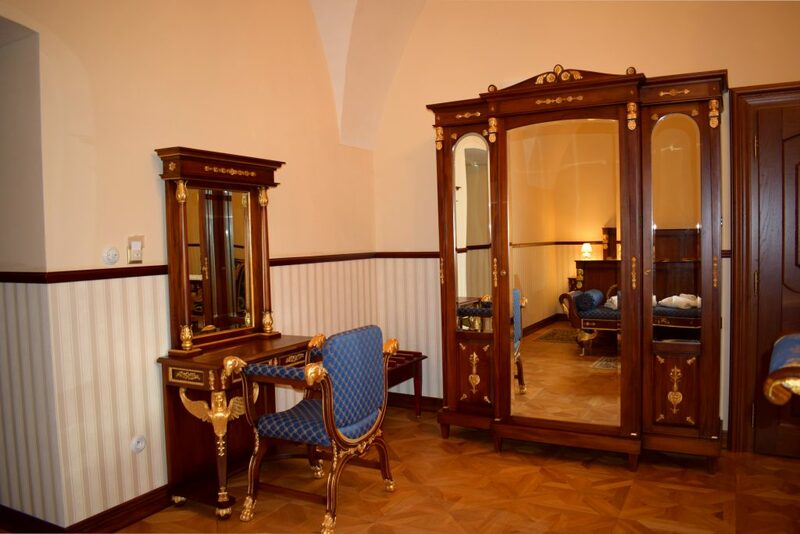 The Deluxe Double room MATHIAS II is found on the first floor in frontal part of the north-east castle wing. 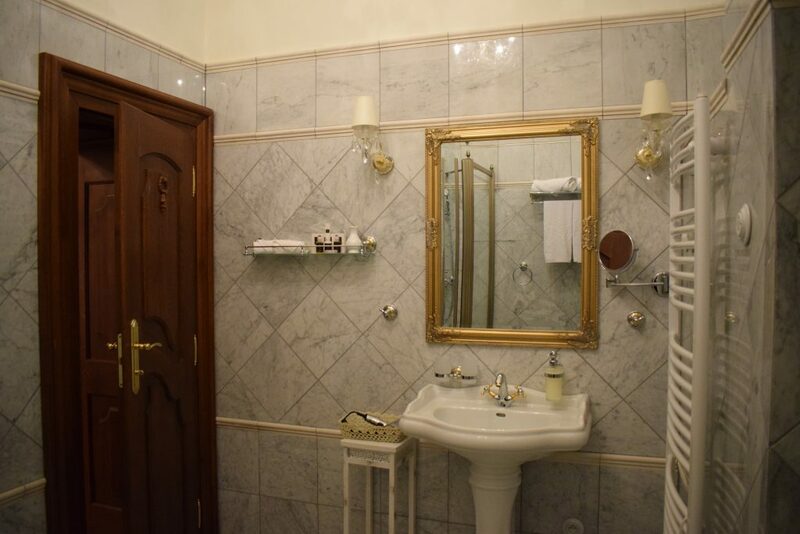 The room is situated in tight proximity of frontal side stairway and lift and also not far from the main castle stairway what secures to the guests a quick access to the castle hall, restaurant, reception but also to wellness and wine tavern. Thanks to its position it offers to the guests a nice outlook of South-Slovak hollow and Revúcka vrchovina highlands. Already at the entry into the room the guests will be bewitched by beautiful furnishings in Classicist Empire Style which is characteristic by its perfection, precision, regularity and gloss. A seating furniture with golden flower textiles and imposing curtains at high windows complete the prevailing red colour of wallpapers with golden flower pattern. In the room there is a precisely worked-out, highly bright furniture of perfect shapes, supplemented with gold-plated ornaments, which come out of ancient and Egyptian symbols. An inlaid wooden floor with detailed pattern, a high decorated stove oven and also an ostentatious picture and mirror in a beautiful ornamental frame of gold emphasize the representativeness, power and perfection which characterize the Empire Style. 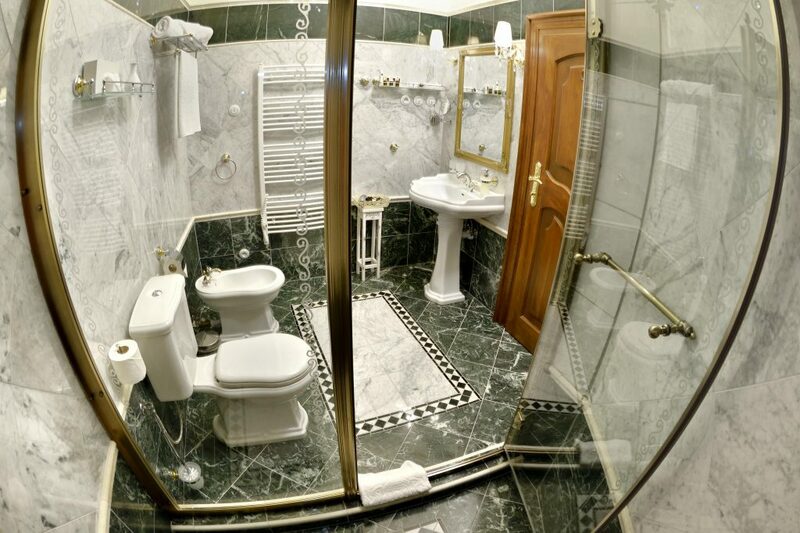 In bathroom a corner shower cubicle with glass walls and ornament is situated. The live colours of stone floor and of bright linings with perfect undisturbed shapes induct a feeling of variety. 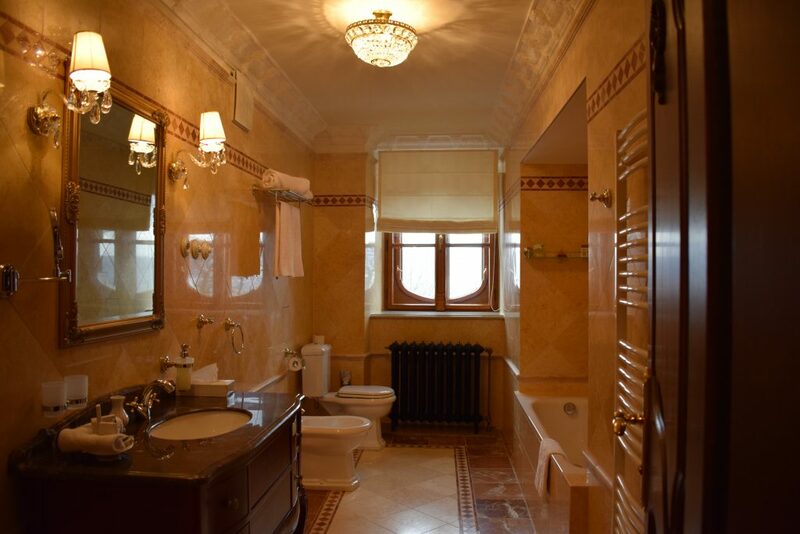 The bathroom spaciousness, in harmony with light colours, is underlined by a high vaulted ceiling with ornaments in foundation part of pillars. The Deluxe SOREAL room is found on the first floor in frontal part of the north-east castle wing Room position in tight proximity of the frontal side stairway and lift, and also of the main castle stairway secures a quick access to the castle and wine tavern. 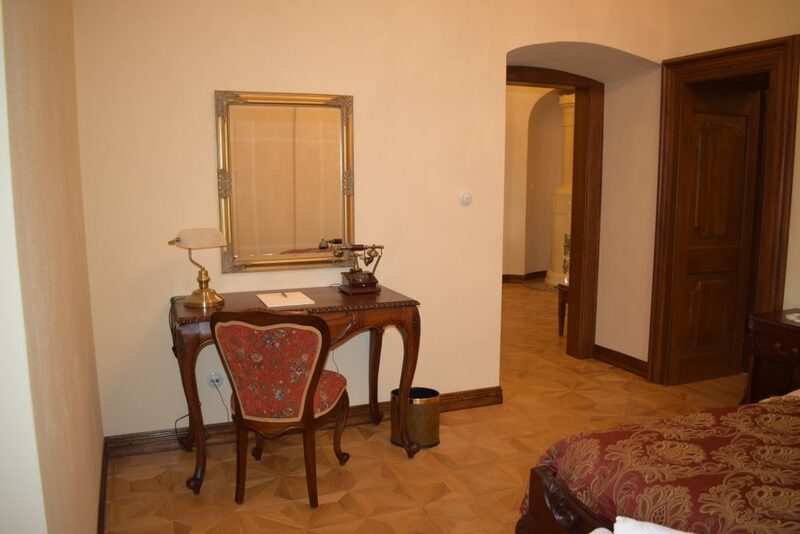 The room is situated in the proximity of the District hall, of the most representative room of the castle hotel. Thanks to its position it offers to the guests a nice outlook of South-Slovak hollow and Revúcka vrchovina highlands. 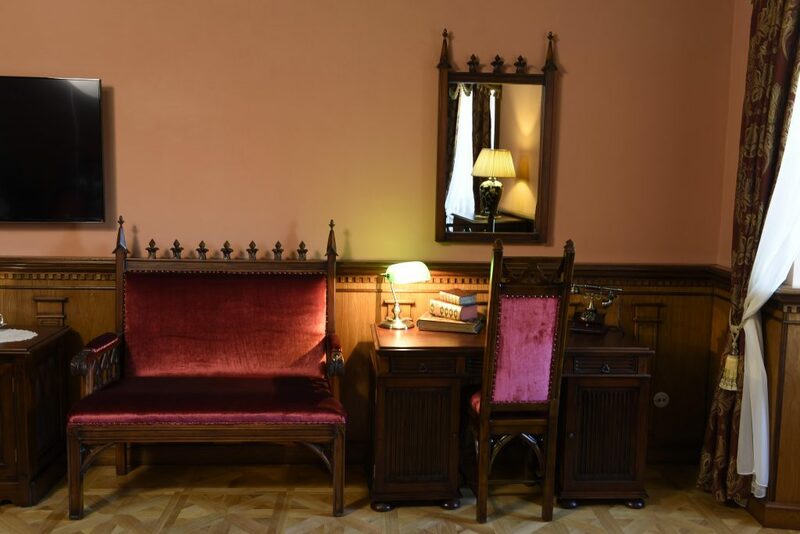 The room is interestingly furnished, it is inspired by a period of sixtieth up to eighties of 20th century on the territory of Central Europe. On the walls there is a supernally blue painting with a light flower pattern which is excellent at a lighting, penetrating through high window, which is bordered with pleasant curtains and lace curtains. A matrimonial bed of simple shapes with medium-high frontal and rear face is situated in the room. The guests can savour a period atmosphere on the comfortable, restored flower chairs at a round conference table, with a typical storage space under the table board. In room there are also delectable work table, wardrobe, mini-bar, wooden radio, separate refrigerator and a lot of housing complements which lively remind the indicated period. A light of crystal chandelier and of floor lamp with lamp shade revitalize the atmosphere which can to some guests remind the recent era. A stepped circumferential cornice is found in the upper part of walls and the ceiling is animated by a stucco circumferential mirror. 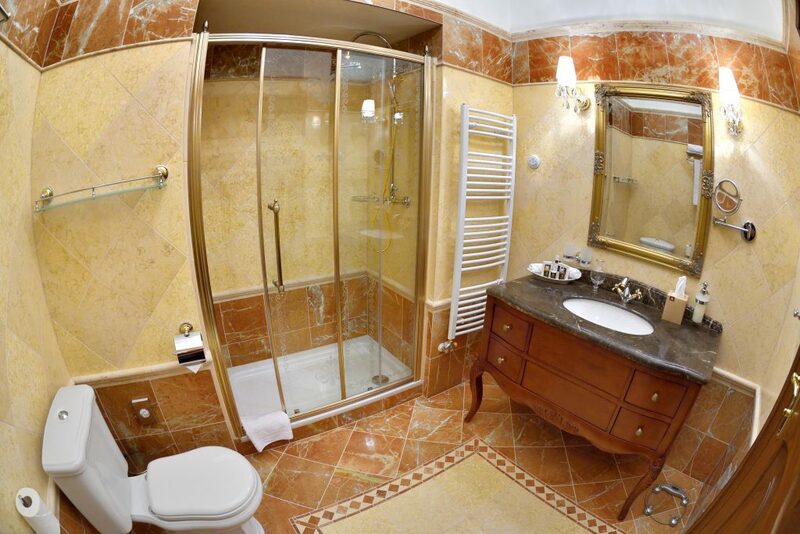 A pleasantly illuminated bathroom with a big shower cubicle with glass walls and ornaments belongs to the room. 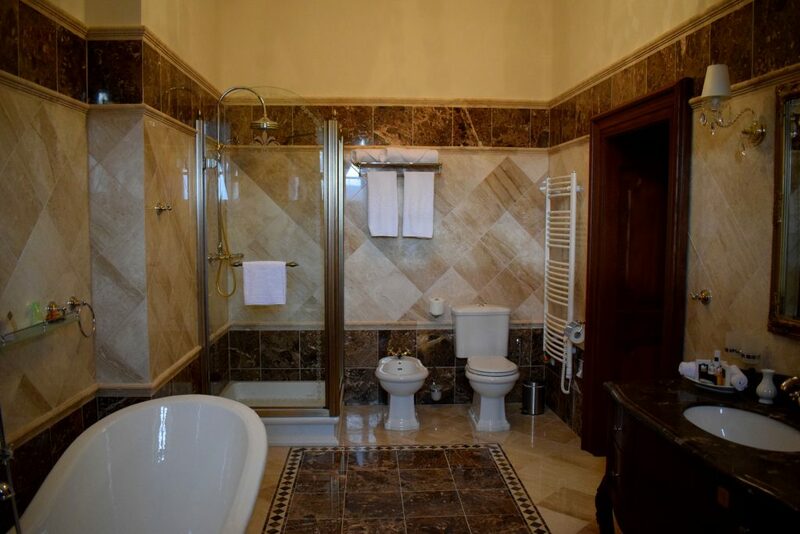 An impressive stone floor and lining in fine colours supplemented with a finely darker tone of border and with ornament and listels create the individuality of the bathroom. The big space is highlighted by the daylight, penetrating through a large window and by a high ceiling which is supplemented by a stepped cornice.